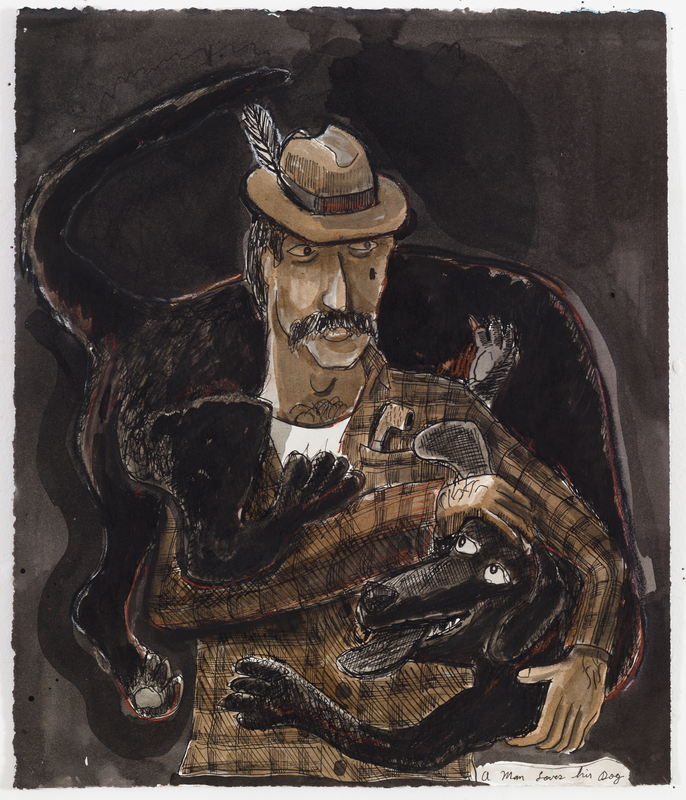 A Man Loves His Dog, 2015, ink, chalk on paper, 15 x 13 in. 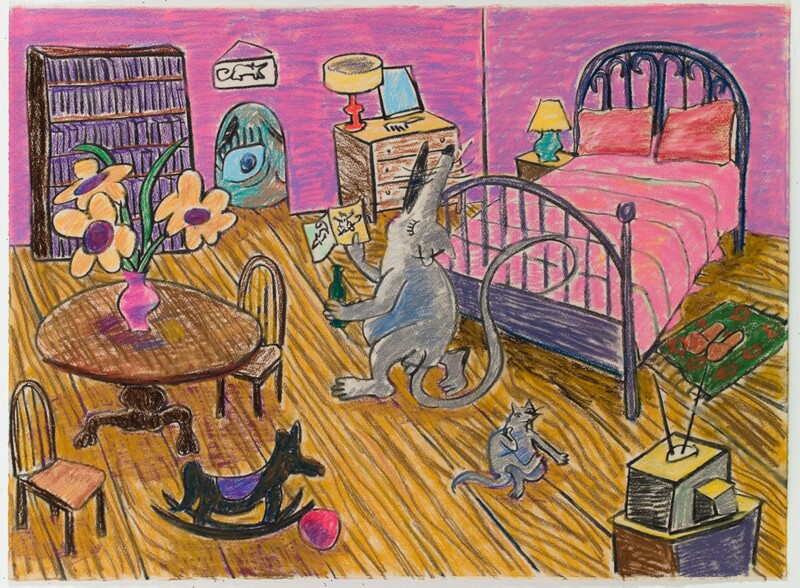 A Mouse’s Home, 2015, watercolor, ink on paper, 22 x 30 in. A Natural Birth Story, 2015, watercolor, pastel on paper, 19 x 12 in. 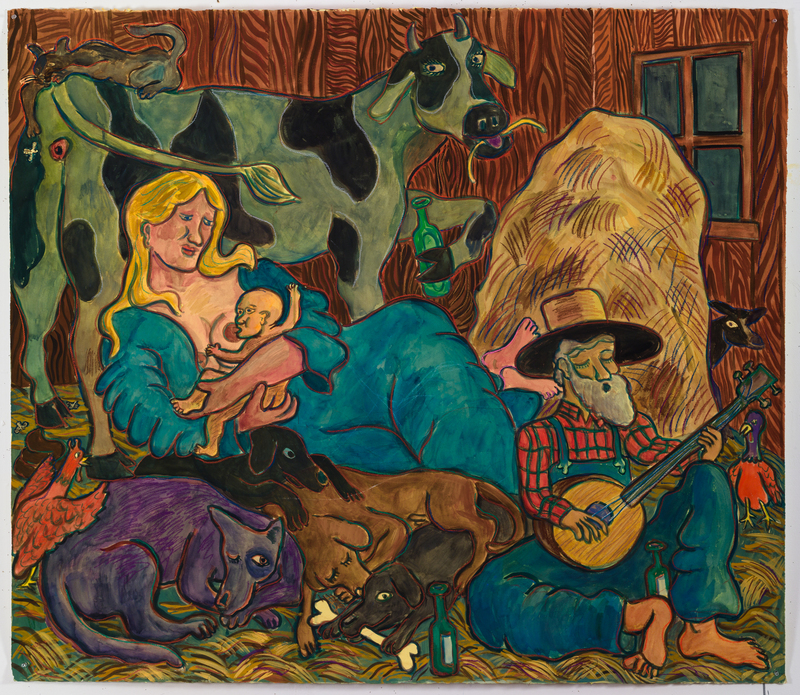 Birth in a Barn, 2016, watercolor, gouache, pastel on paper, 51 x 59 in. 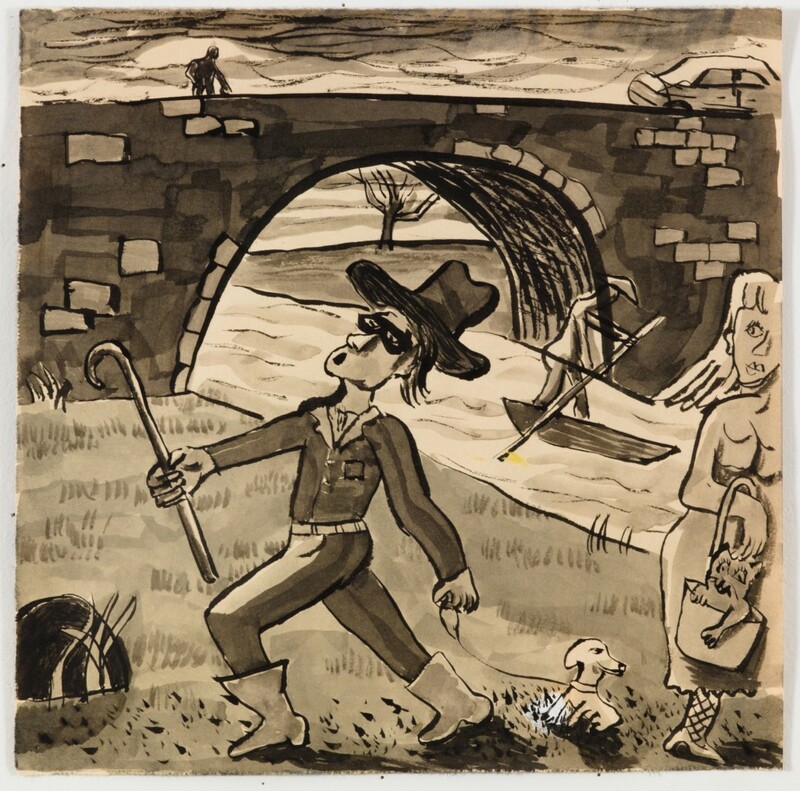 By the River, 2015, ink on paper, 10 x 10 in. 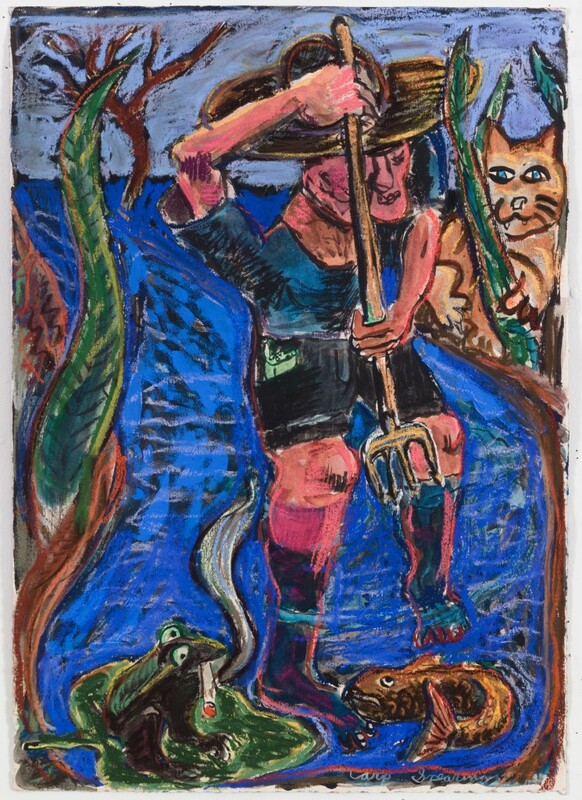 Carp Spearer, 2015, watercolor, gouache, pastel on paper, 20 x 14 in. 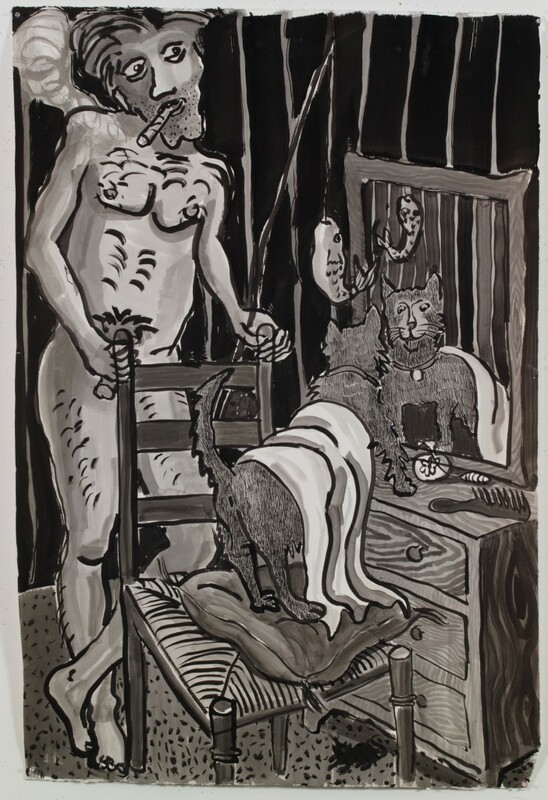 Cat Looking in Mirror, 2015, ink on paper, 51 x 35 in. 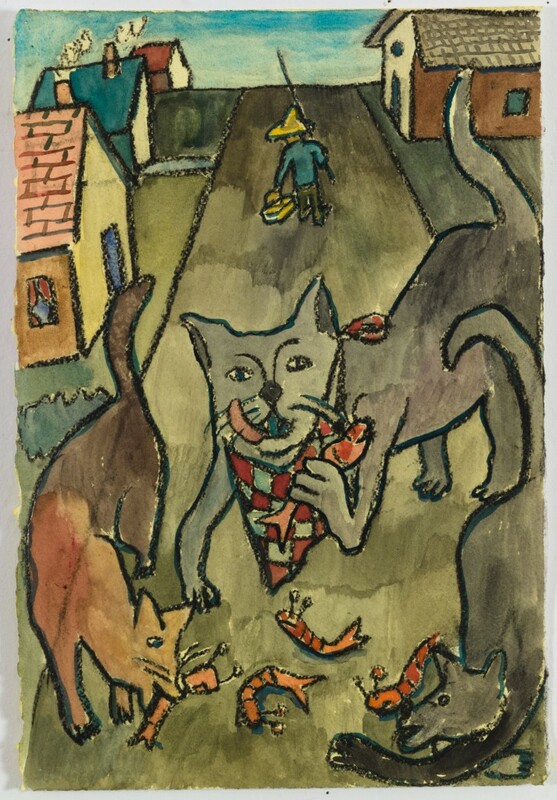 Cats Eating Shrimp, 2016, watercolor, chalk on paper, 13.5 x 9 in. 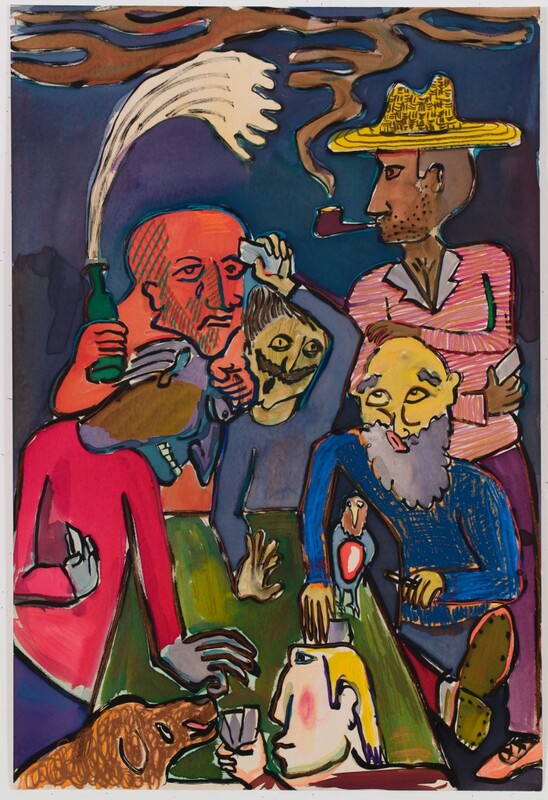 Caught Drinking Beer with the Boys, 2015, watercolor, ink, pastel on paper, 16 x 18 in. 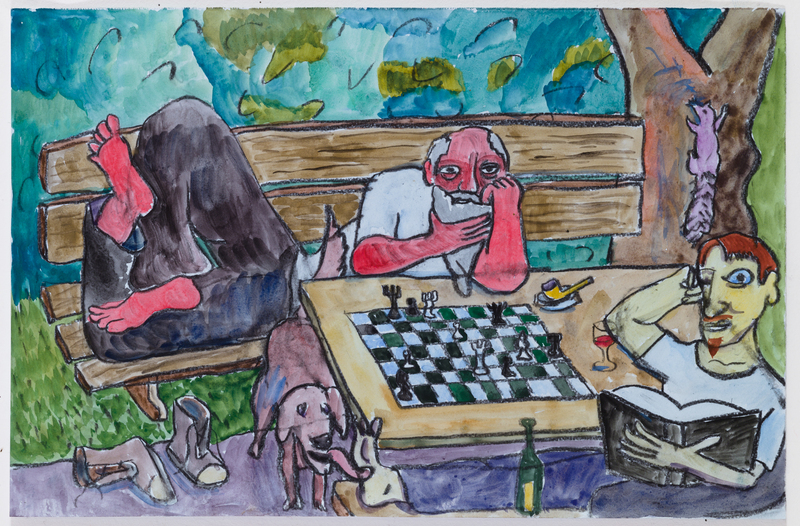 Chess Players in Park, 2015, watercolor, pastel on paper, 12 x 19 in. 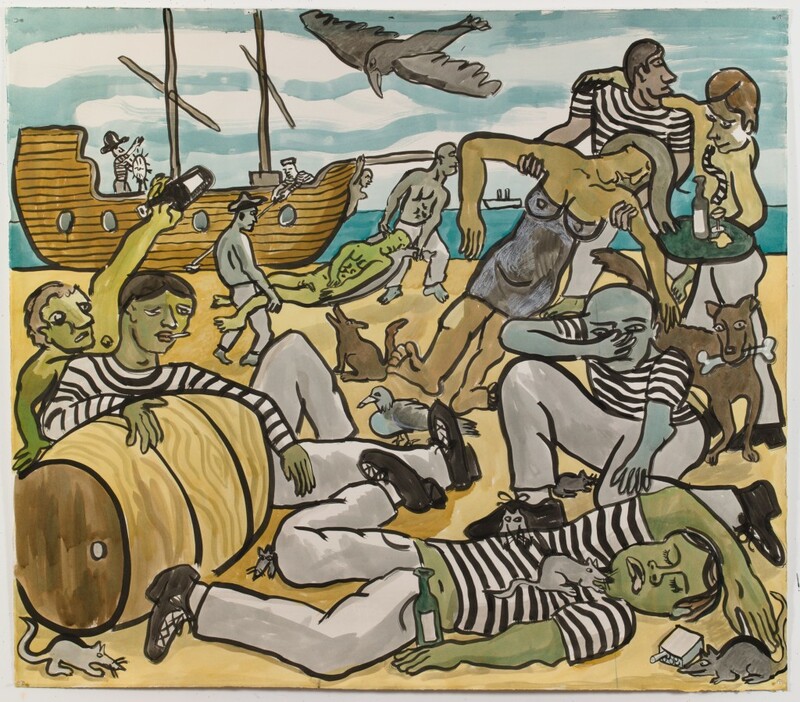 Chinese Men Gambling, 2016, ink, gouache on paper, 22 x 31 in. 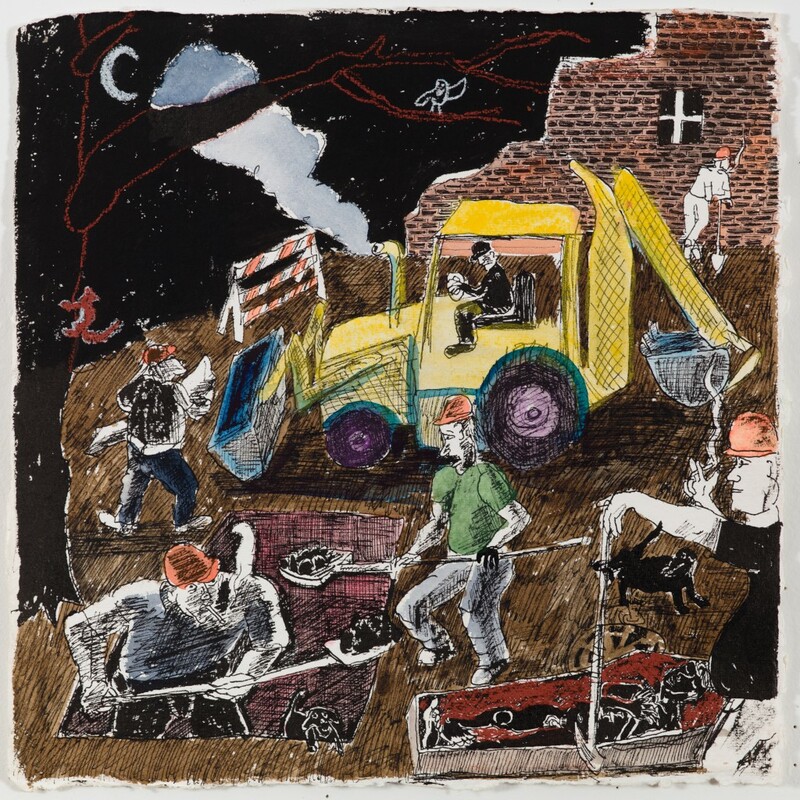 Construction Workers Digging a Grave at Night, 2015, ink, pastel on paper, 12 x 12 in. 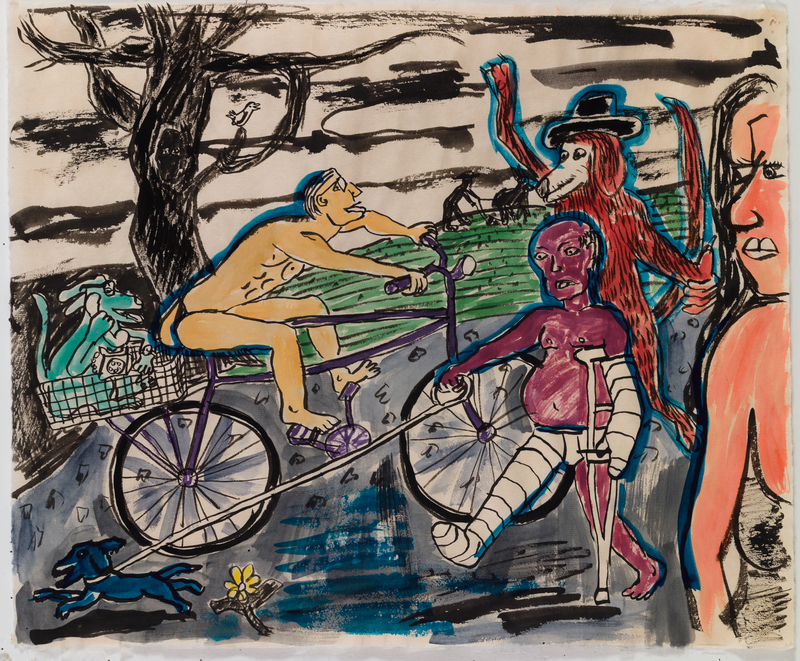 Country Cyclist, 2015, ink on paper, 17 x 20 in. 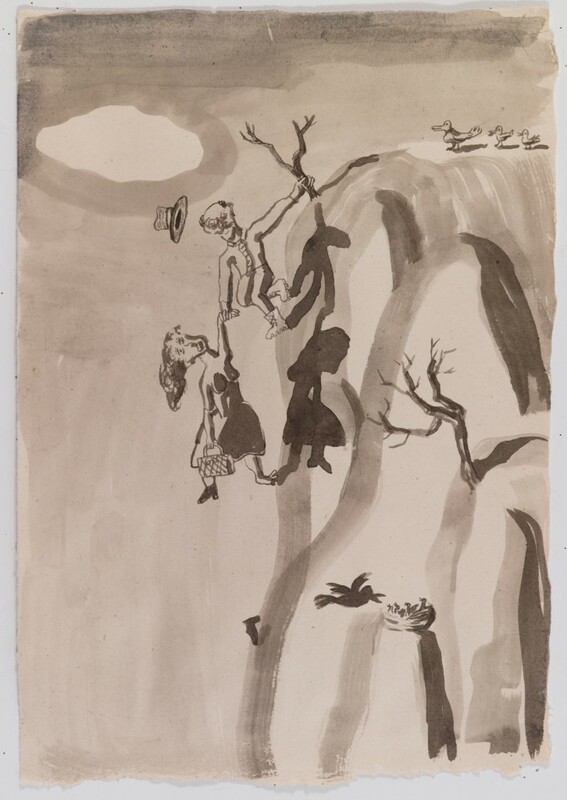 Couple Hanging Off Cliff, 2015, ink on paper, 22 x 15 in. 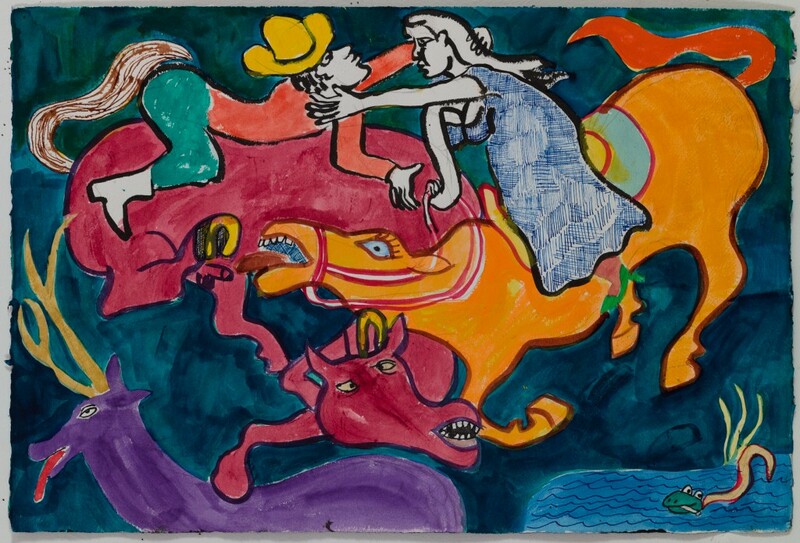 Couple Kissing on Horses, 2015, ink, watercolor on paper, 15 x 22 in. 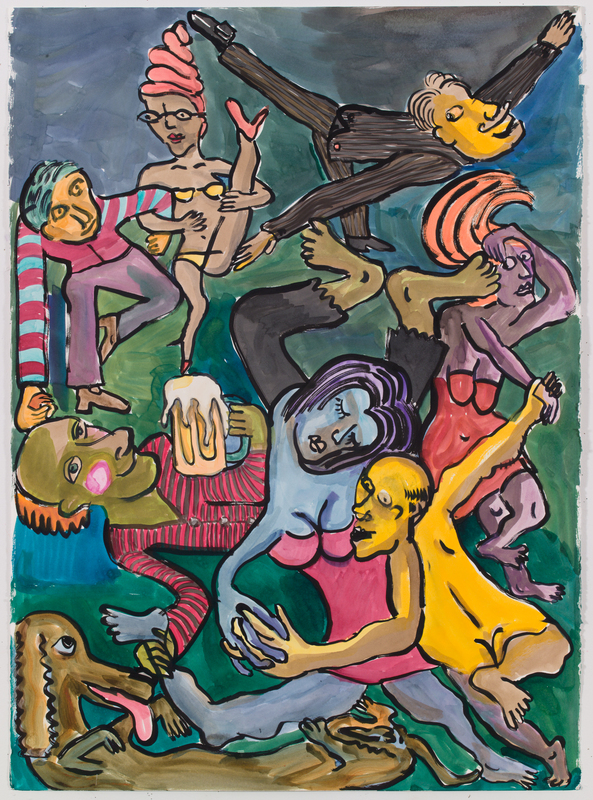 Dancing People (w/ Dog), 2015, ink on paper, 41 x 30 in. 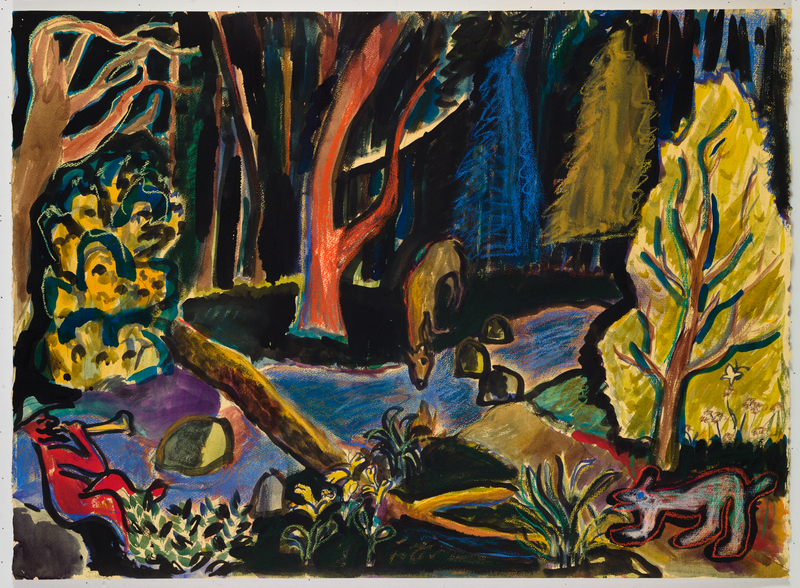 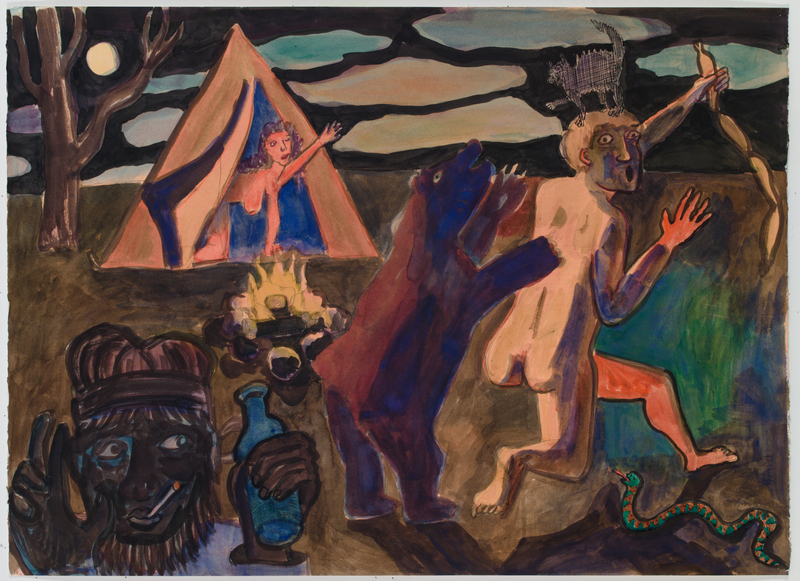 Dark Forest, 2015, ink watercolor, gouache, pastel on paper, 22 x 30 in. 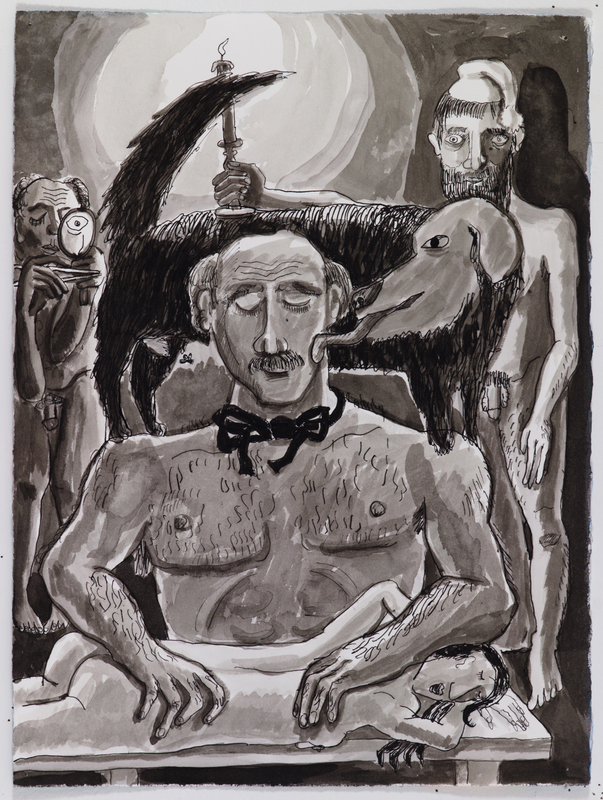 Devil in Bathtub, 2015, ink, chalk on paper, 12 x 10 in. 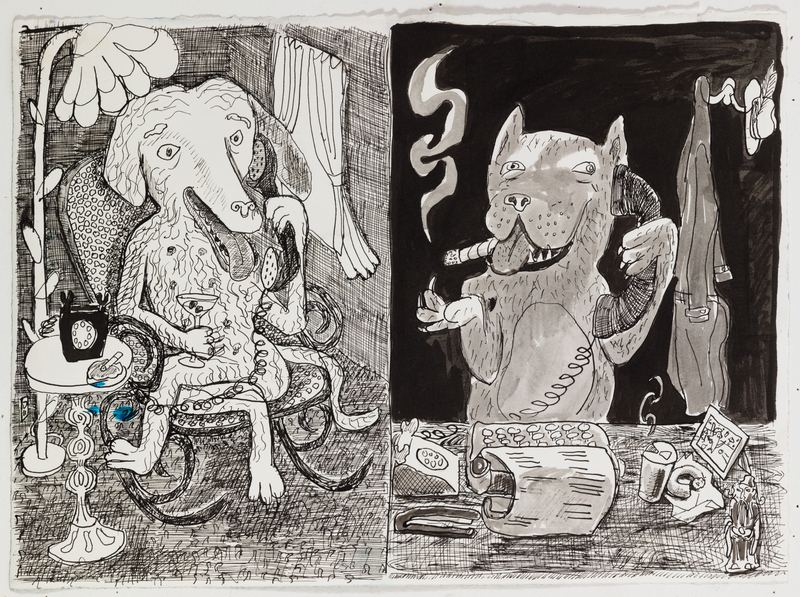 Dogs Talking on Phone, 2015, ink on paper, 12 x 16 in. 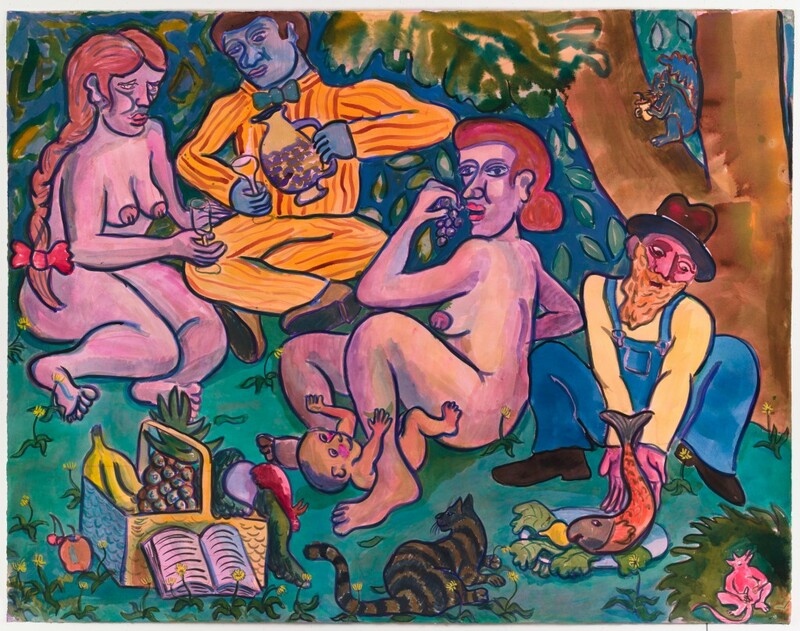 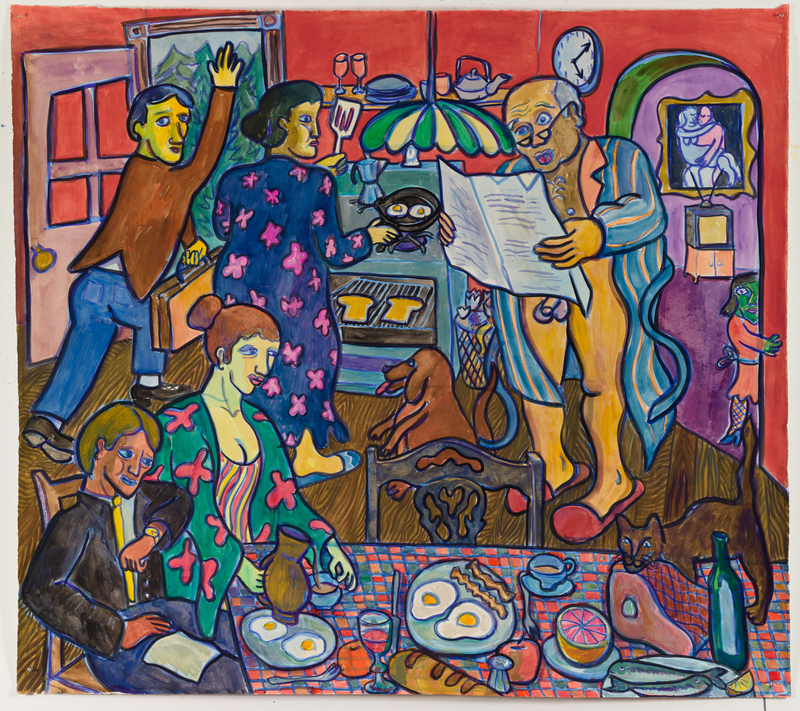 Family Breakfast, 2016, watercolor, gouache on paper, 51 x 60 in. 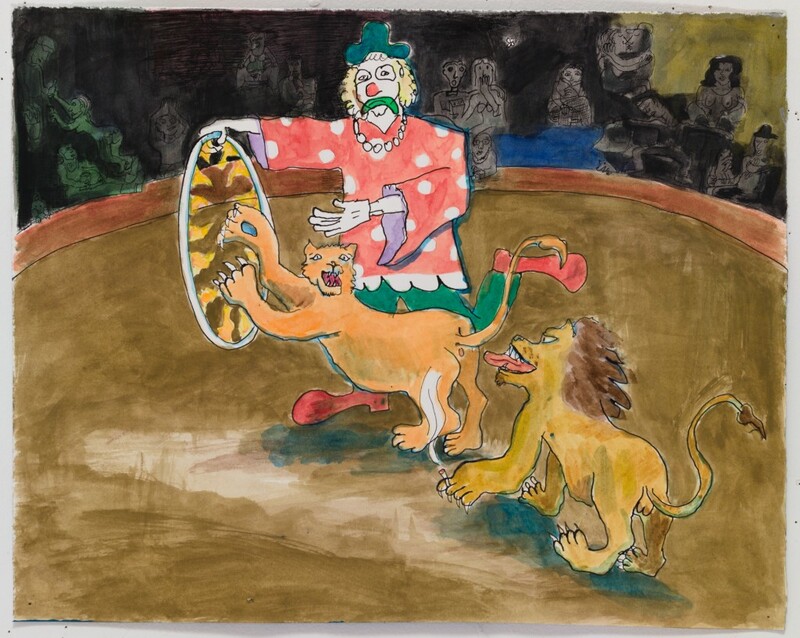 Female Lion Jumping throught the Ring of Fire, 2015, ink, watercolor on paper, 14 x 18 in. 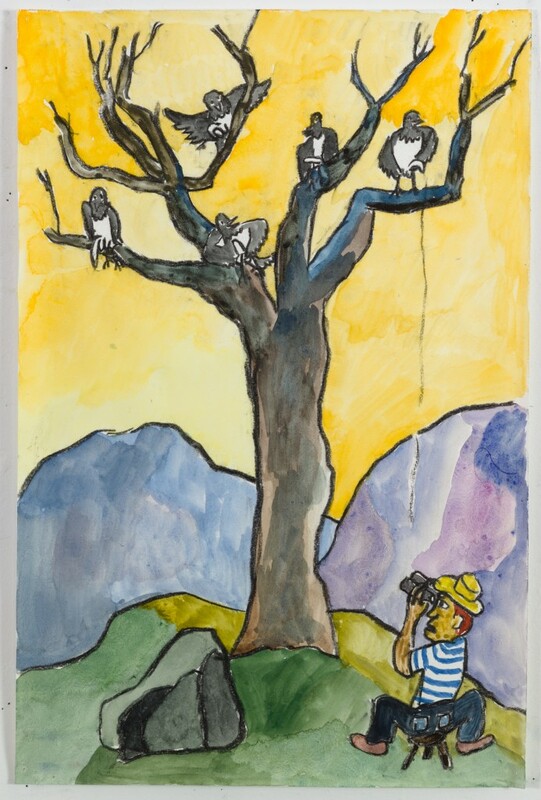 Five Birds in a Tree, 2016, watercolor, pastel on paper, 19 x 12 in. 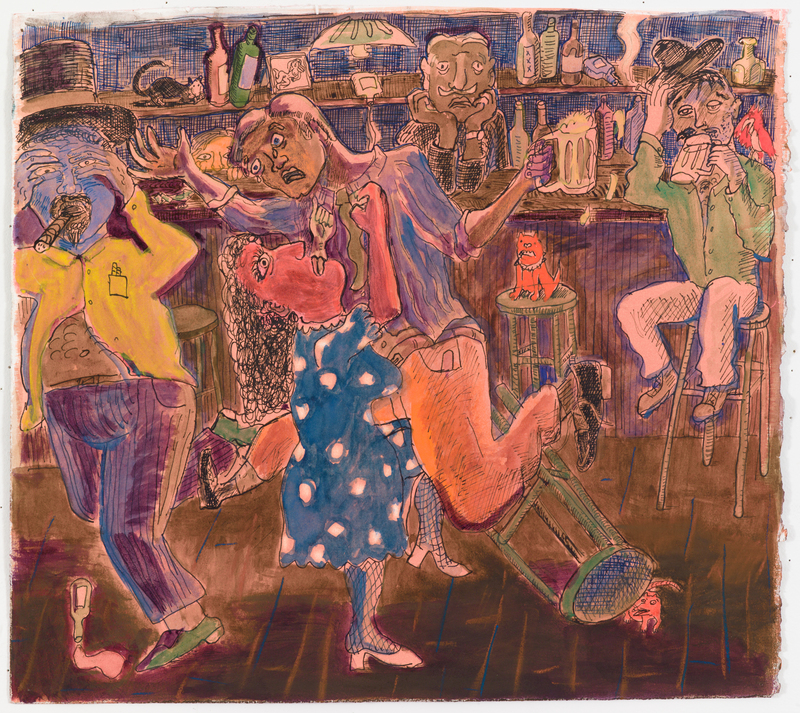 Give a Dog a Bone, 2015, ink, pastel on paper, 13.5 x 20 in. 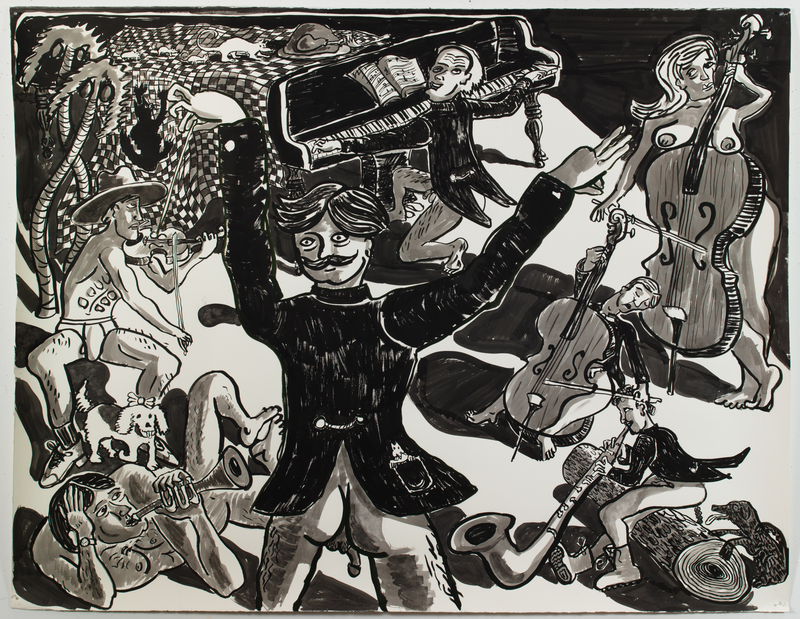 Grand Symphony, 2015, ink on paper, 60 x 77.5 in. Halsey Stop, 2016, ink on paper, 25 x 18 in. 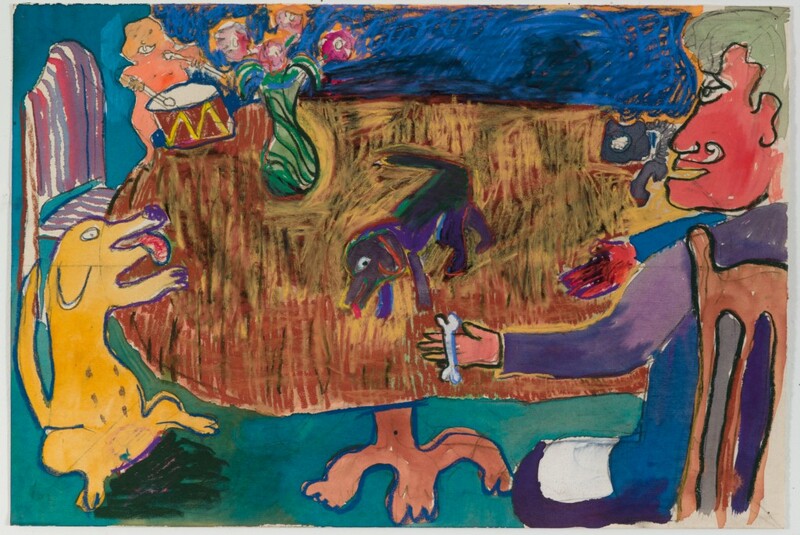 Hotdog Stand (Man w/ Mustard Spill), 2016, ink, watercolor, gouache on paper, 51 x 55 in. 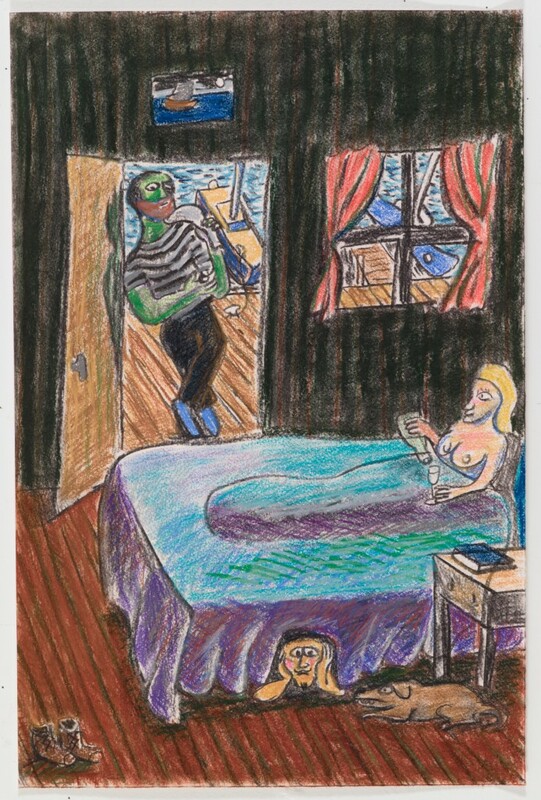 Husband’s Back, 2016, watercolor, pastel on paper, 19 x 12.5 in. 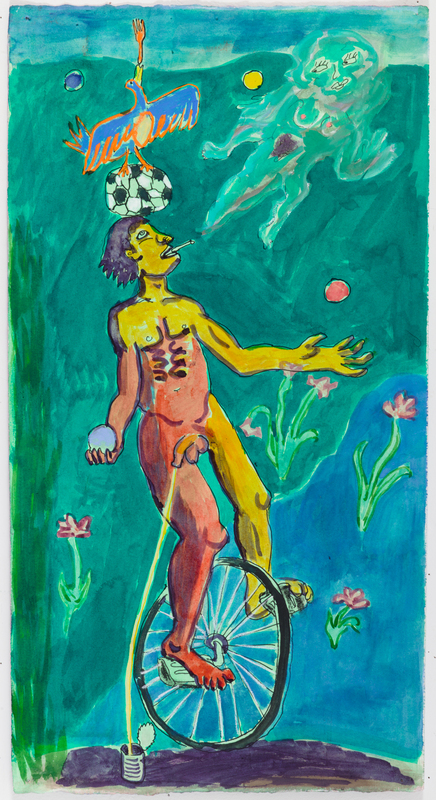 Juggler on Unicycle, 2015, ink, pastel on paper, 22 x 11.5 in. 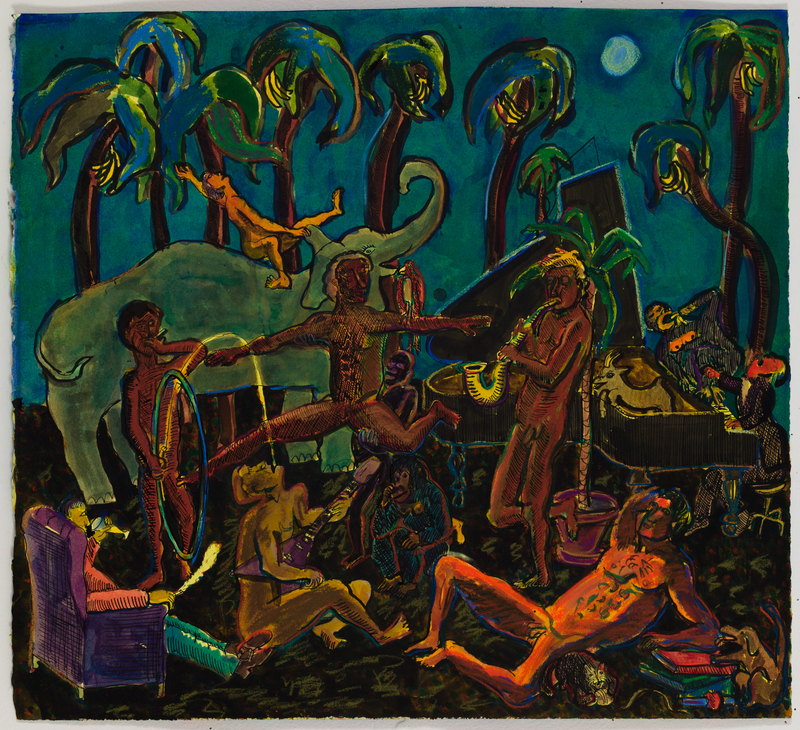 Jungle Circus, 2015, ink, watercolor, gouache, pastel on paper, 18 x 19 in. 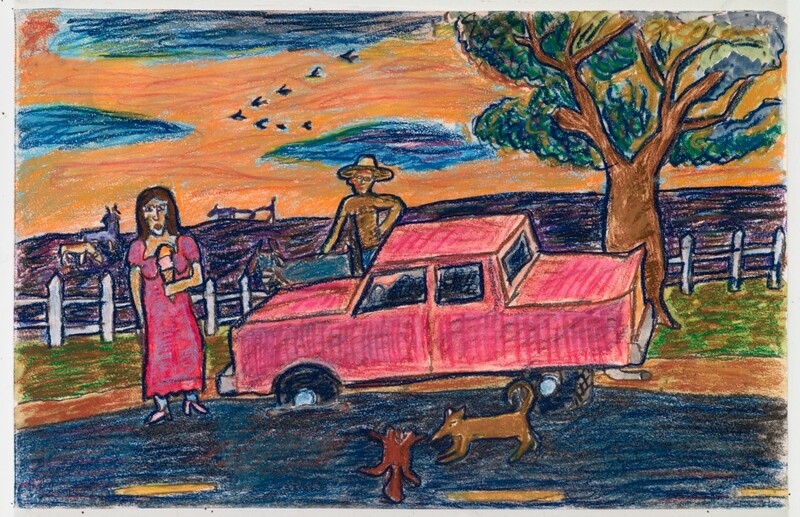 Lady w/ Icecream Cone (Flat Tire), 2016, pastel on paper, 12 x 19 in. 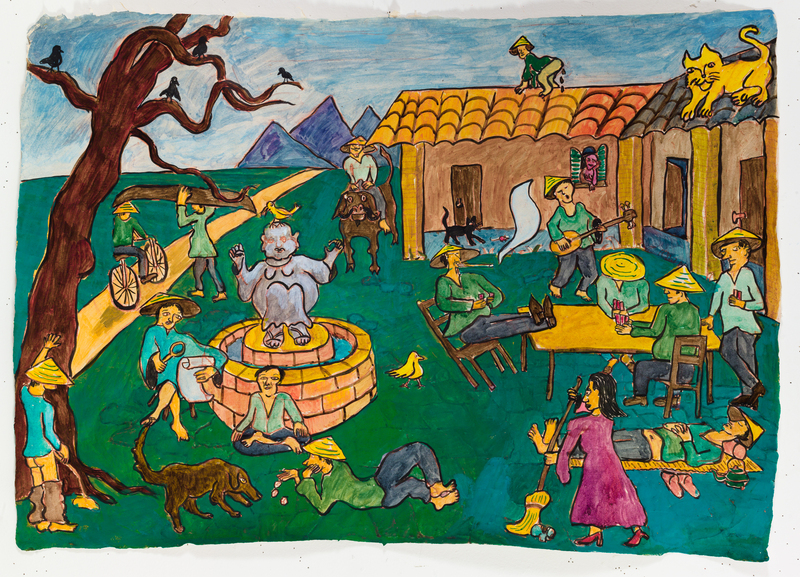 Lunch on the Grass, 2016, ink, watercolor, gouache on paper, 60 x 77 in. 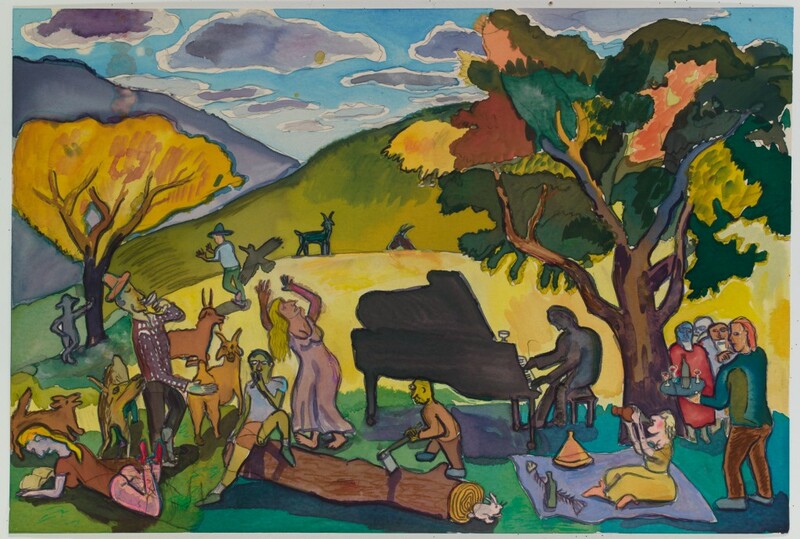 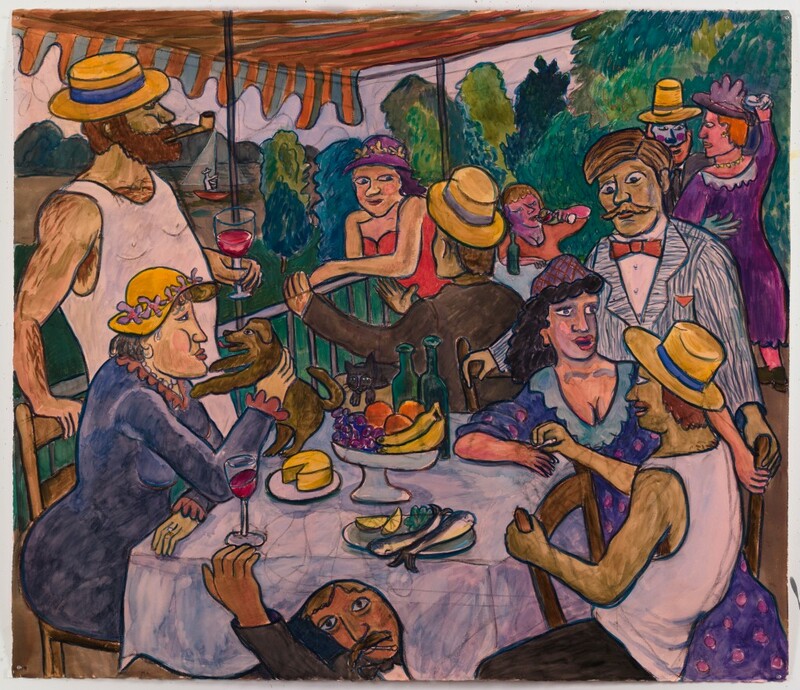 Luncheon of the Boating Party, 2016, watercolor, gouache, pastel on paper, 51 x 60 in. 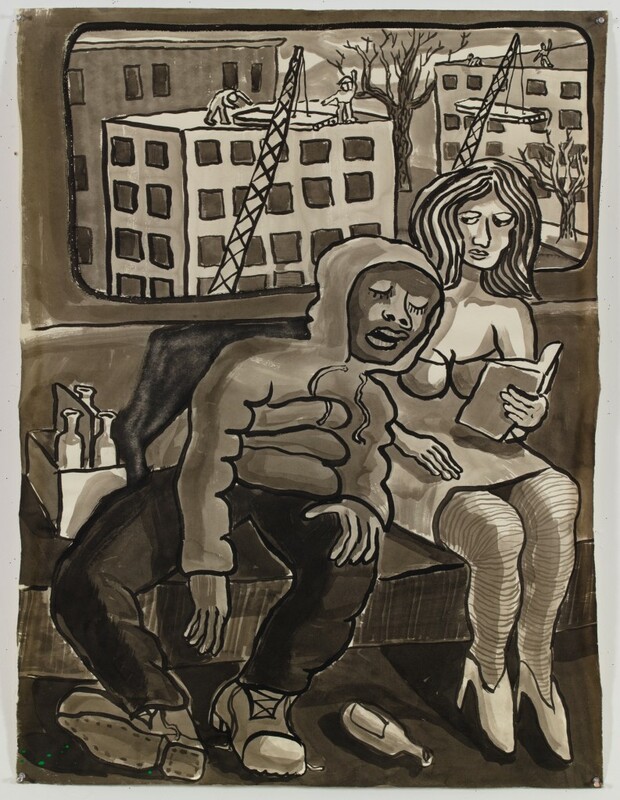 Man Asleep on Subway, 2015, ink on paper, 41 x 31 in. 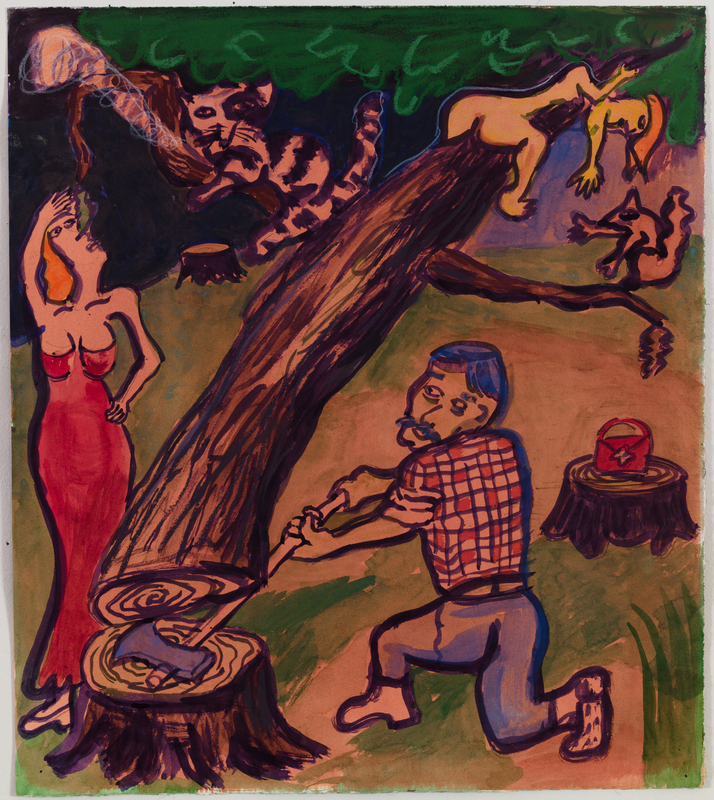 Man Chopping Down Tree, 2015, ink, watercolor, gouache, pastel on paper, 18 x 15.5 in. 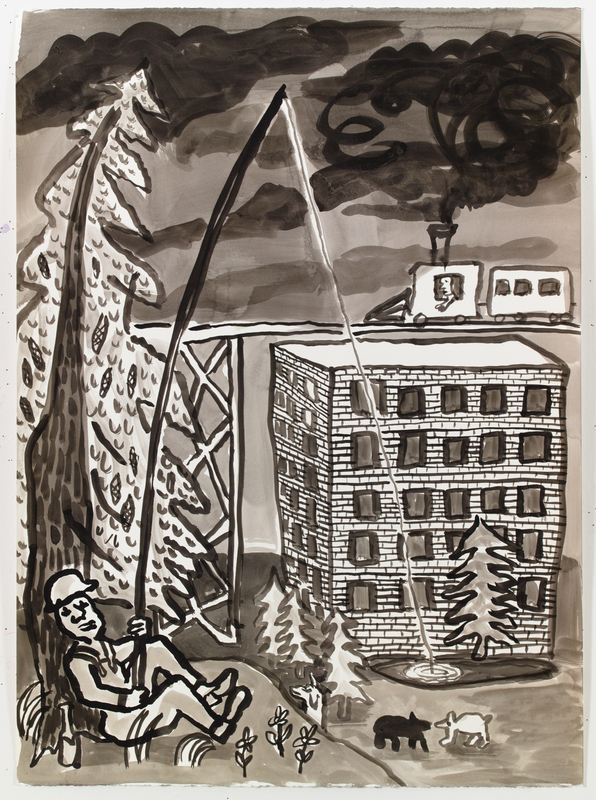 Man Fishing at Development, 2015, ink on paper, 30 x 22 in. 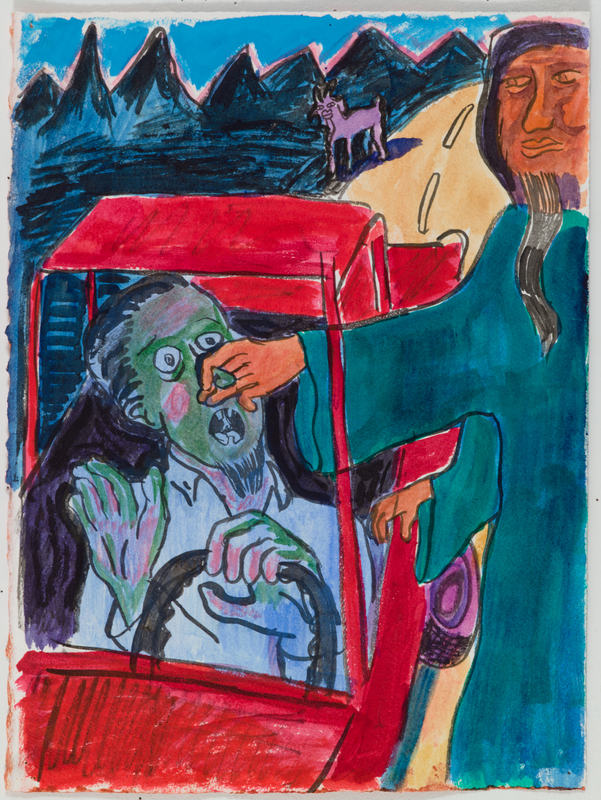 Man Grabbing Driver’s Nose, 2015, ink on paper, 15 x 11 in. 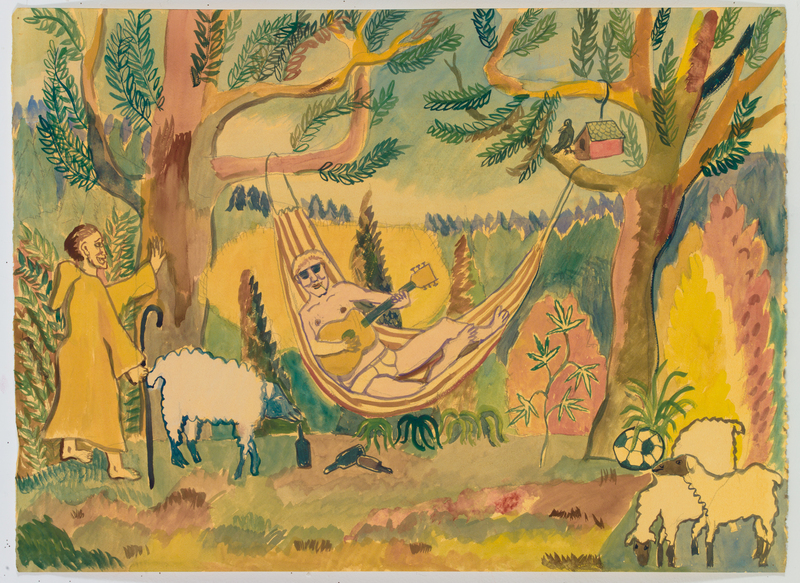 Man in a Hamock (w/ sheep), 2015, ink on paper, 22 x 30 in. 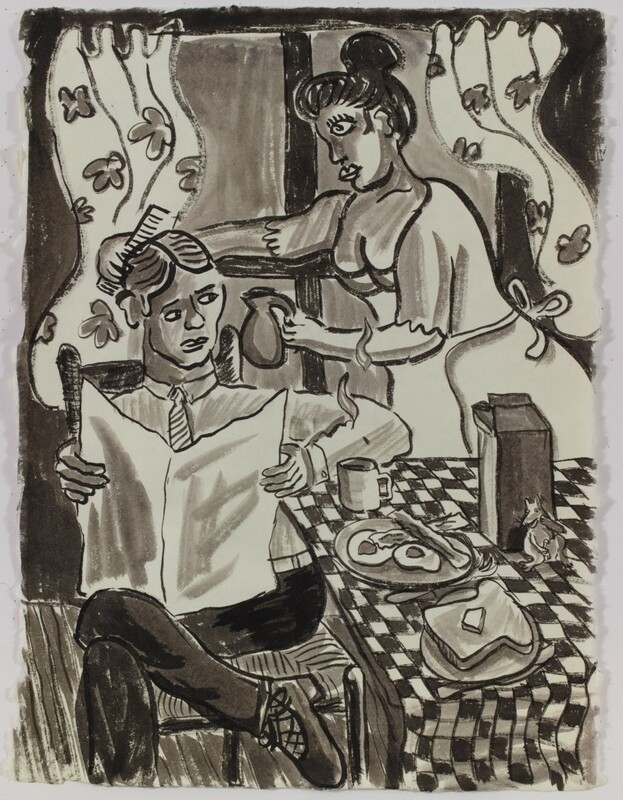 Man Peering through Newspaper, 2016, watercolor on paper, 35 x 26 in. Man Reading by Candlelight, 2016, pastel on paper, 11 x 15 in. 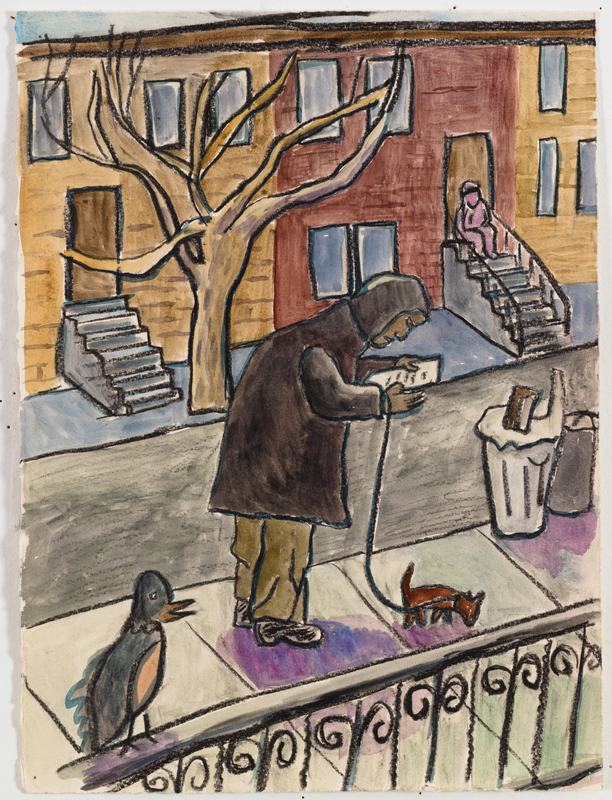 Man Reading Paper while Walking Dog, 2016, watercolor, chalk on paper, 15 x 11 in. 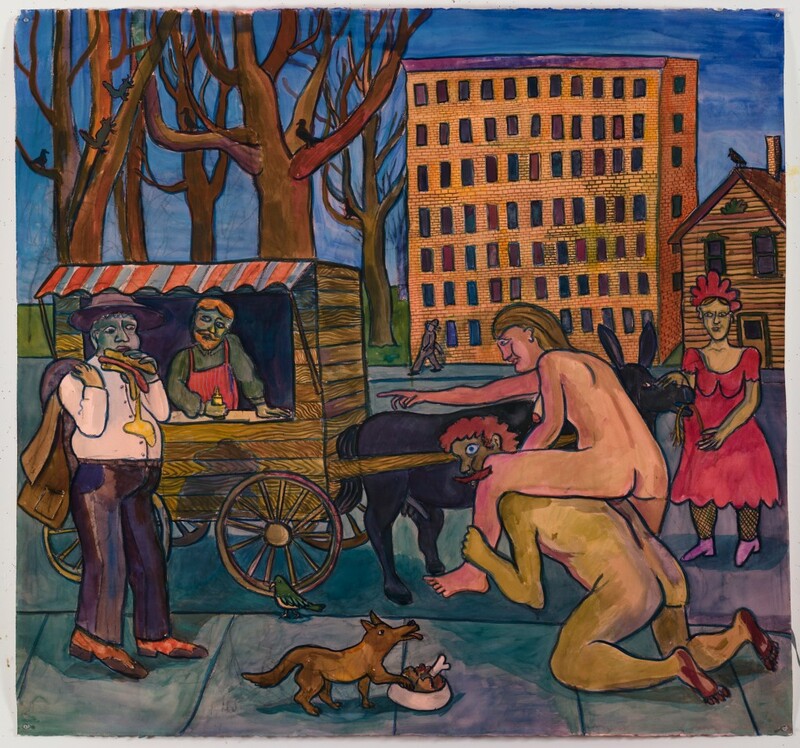 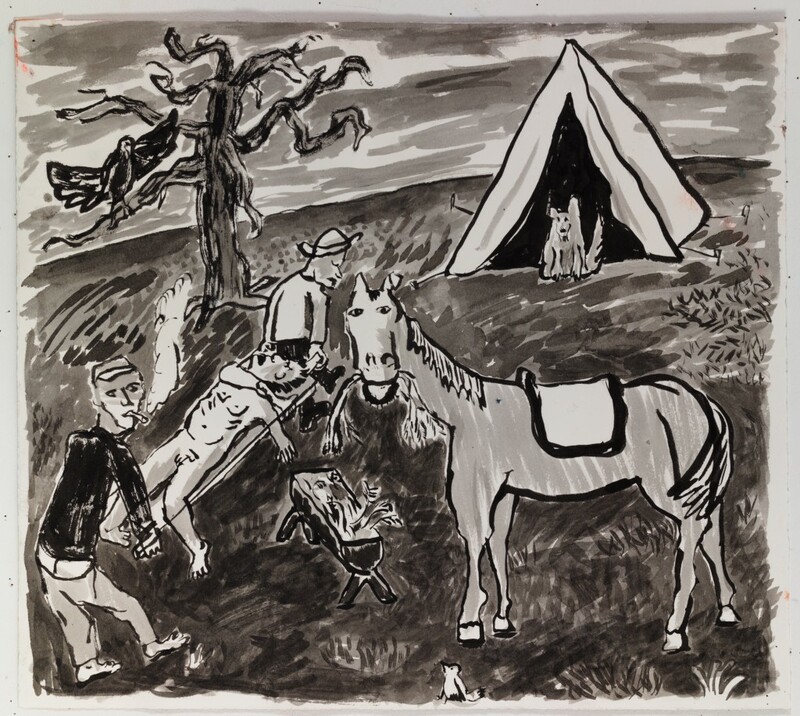 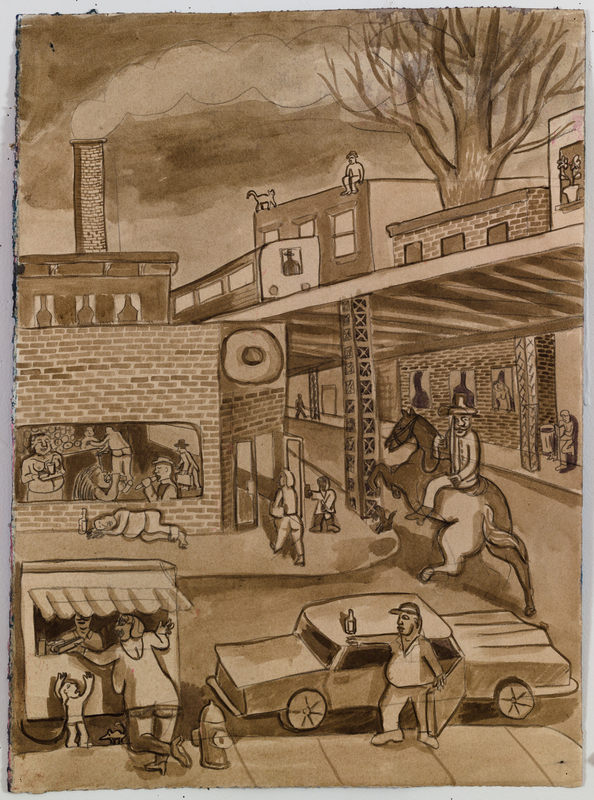 Man, Woman, and Horse on Stretchers, 2015, ink on paper, 22 x 30 in. 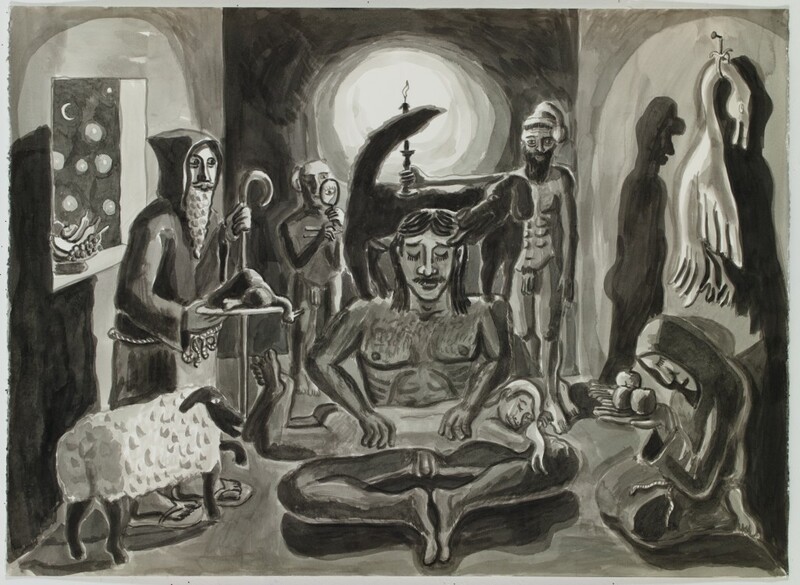 Masseuse by Candlelight, 2015, ink on paper, 15 x 11 in. 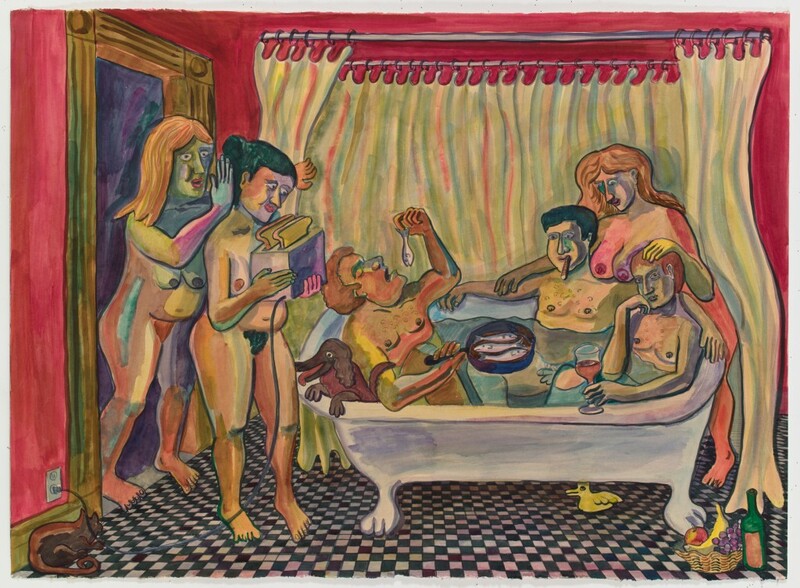 Men in Bathtub, 2015, ink, watercolor on paper, 30 x 41 in. 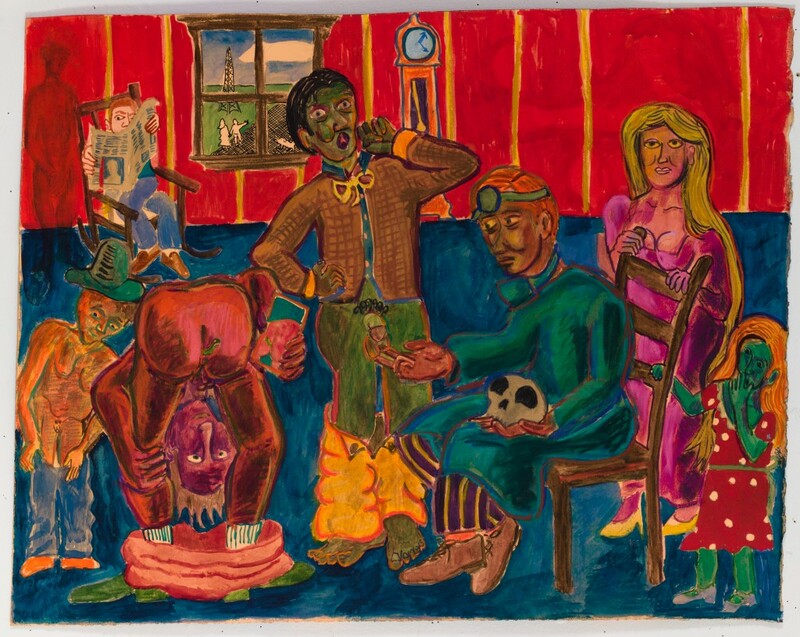 Men Playing Poker, 2015, ink, pastel on paper, 40 x 27 in. 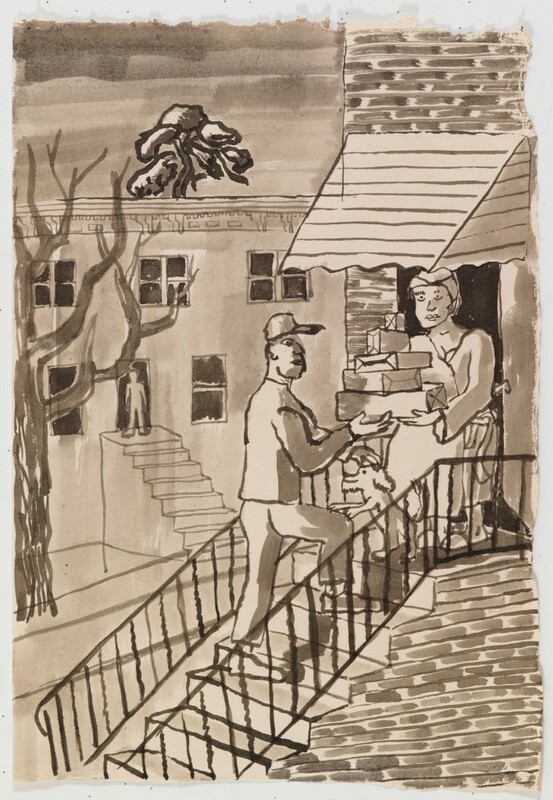 Package Delivery, 2015, ink on paper, 22 x 15 in. 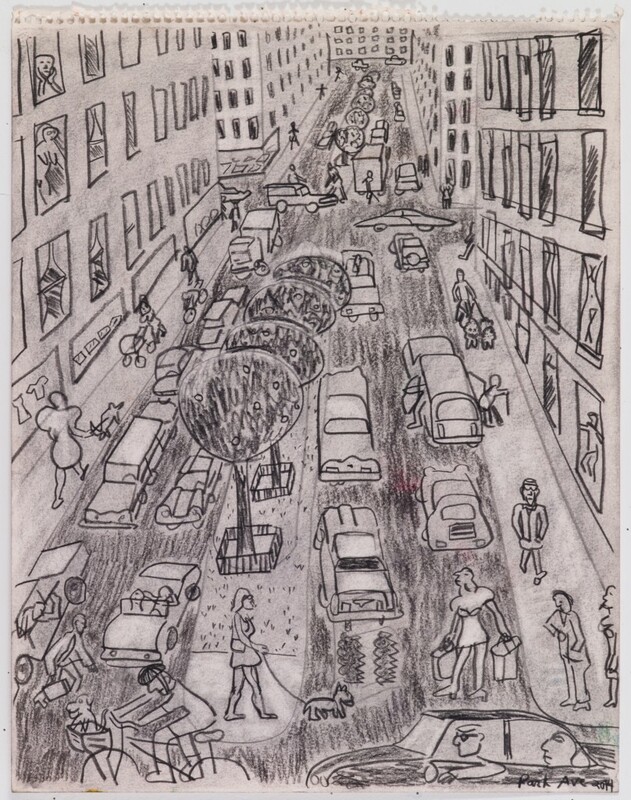 Park Ave, 2015, chalk on paper, 18 x 14 in. 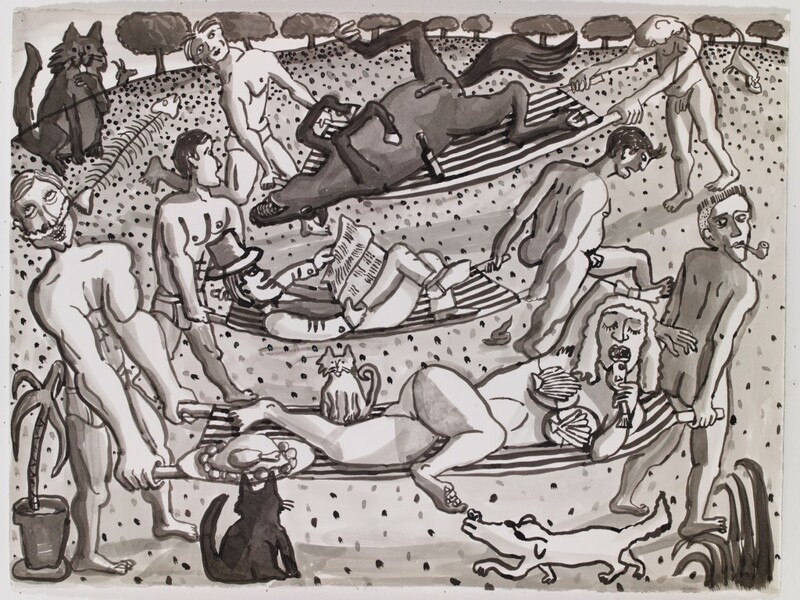 Pastoral Scene, 2015, ink on paper, 27 x 40 in. 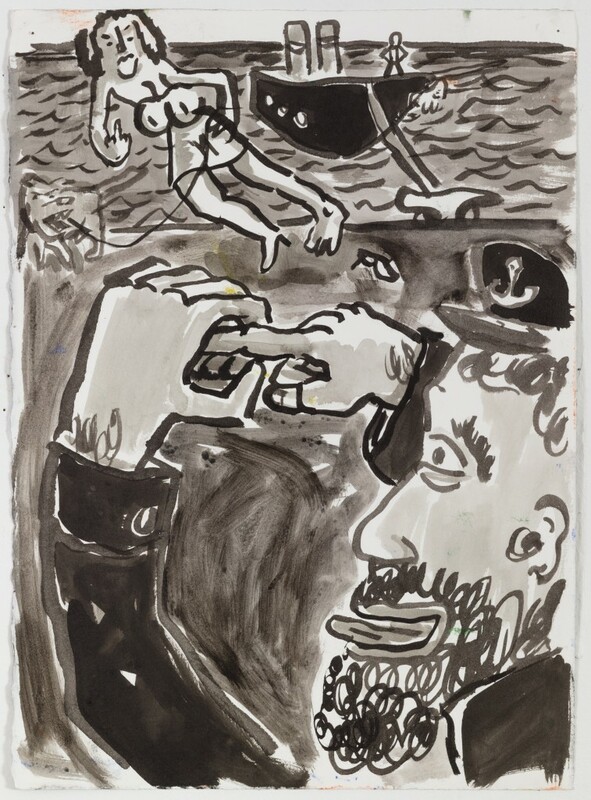 Perverted Sea Captain, 2015, ink on paper, 15 x 11 in. 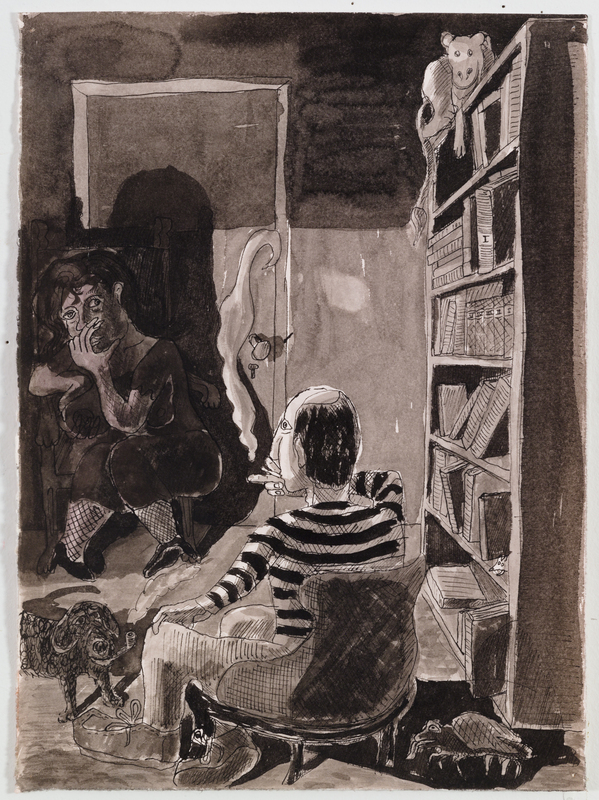 Psycologist Office, 2015, ink on paper, 12 x 9 in. 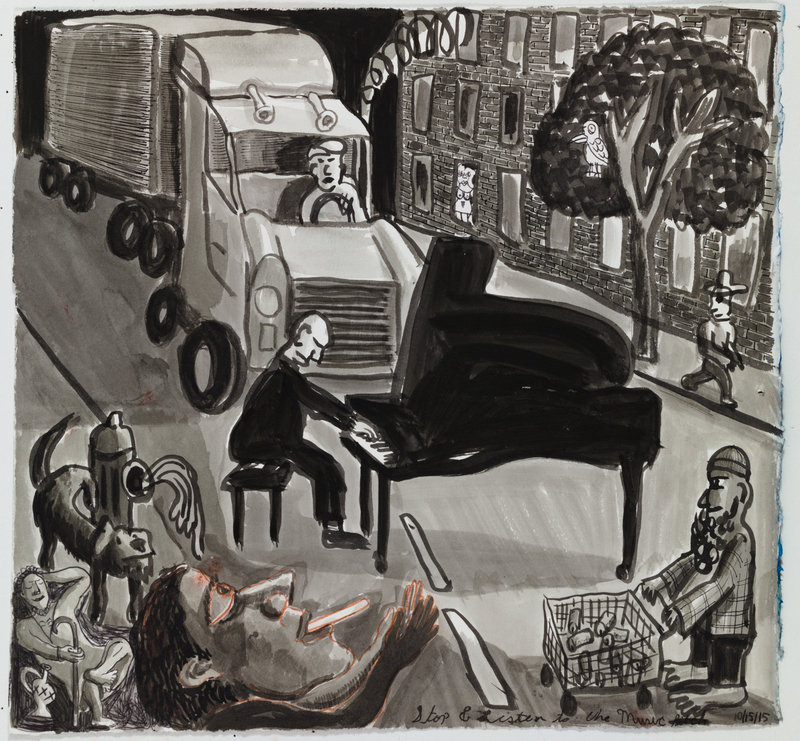 Pianist Performing in Street, 2015, ink, chalk on paper, 15 x 16 in. 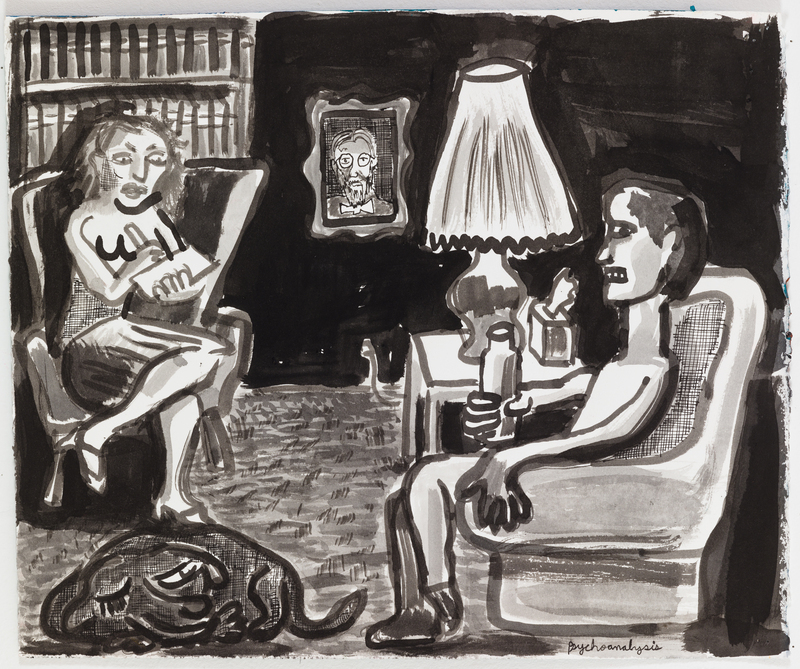 Psychoanalysis, 2015, ink on paper, 13 x 15.5 in. 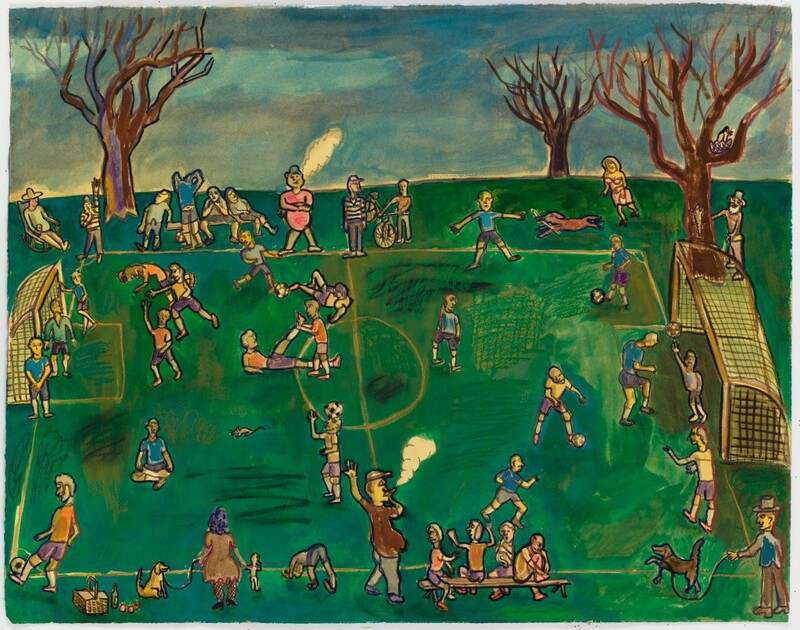 Soccer Match, 2016, watercolor, gouache, pastel on paper, 24 x 30 in. Soldier on a Stretcher, 2015, ink on paper, 16 x 18 in. 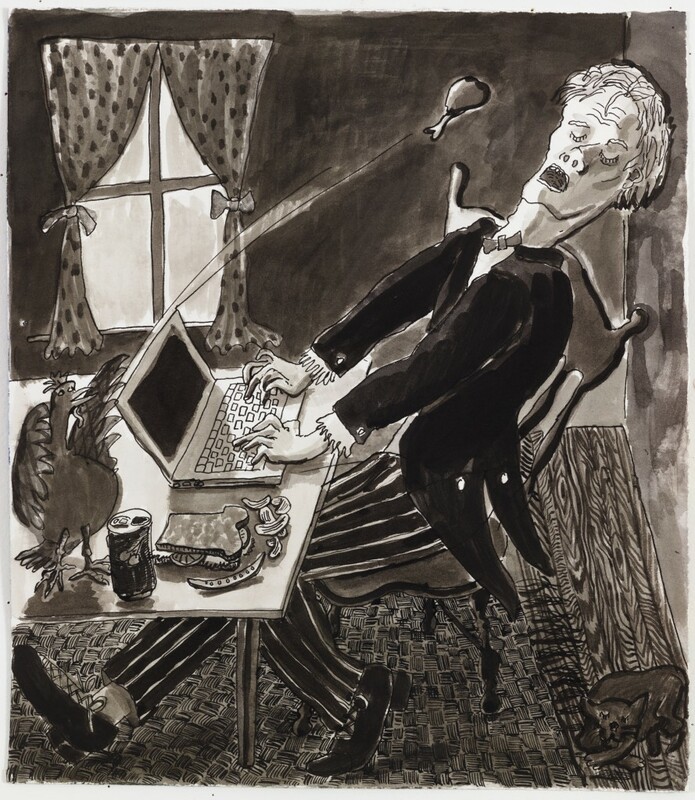 The Computerist, 2015, ink on paper, 16 x 13.5 in. 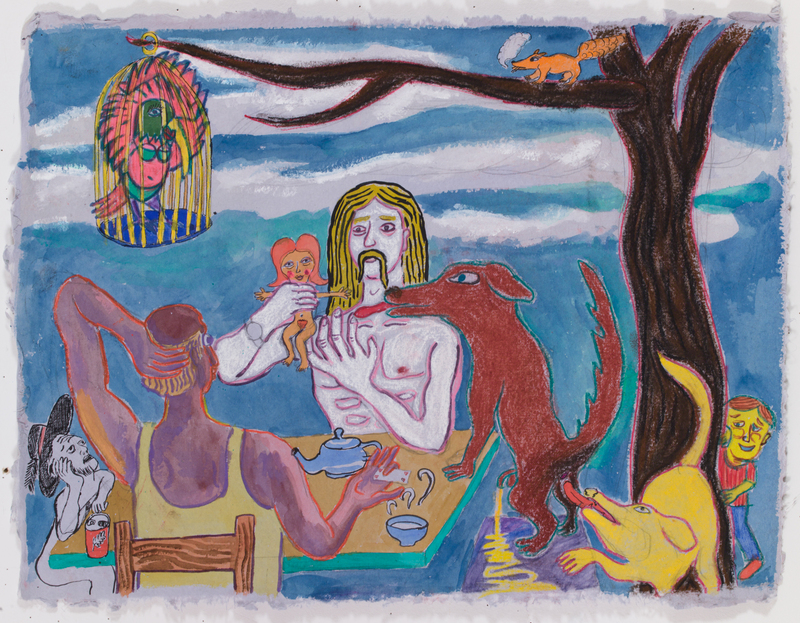 The Hungry Bear, 2015, ink, pastel on paper, 22 x 30 in. The Married Couple at Breakfast, 2015, ink on paper, 35 x 26 in. 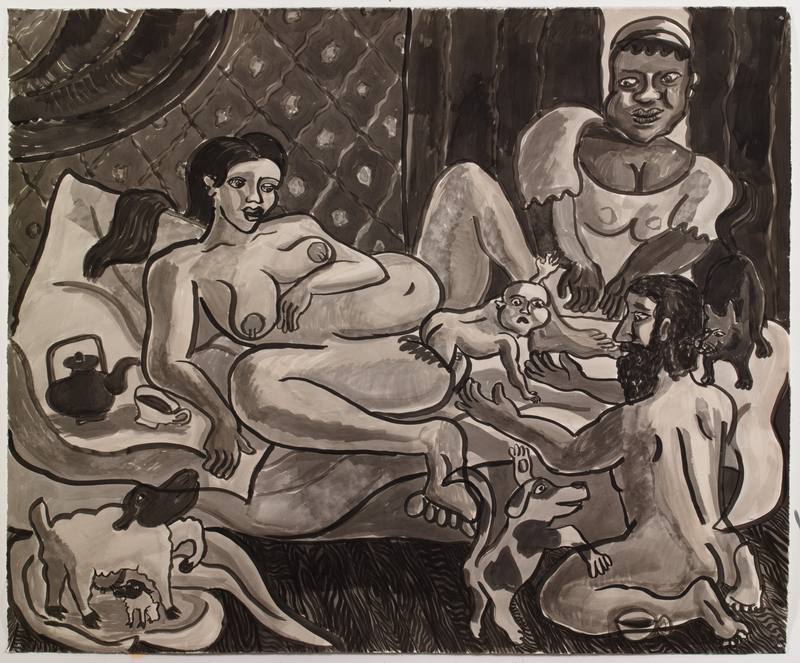 The Natural Home Birth, 2015, ink on paper, 60 x 73 in. 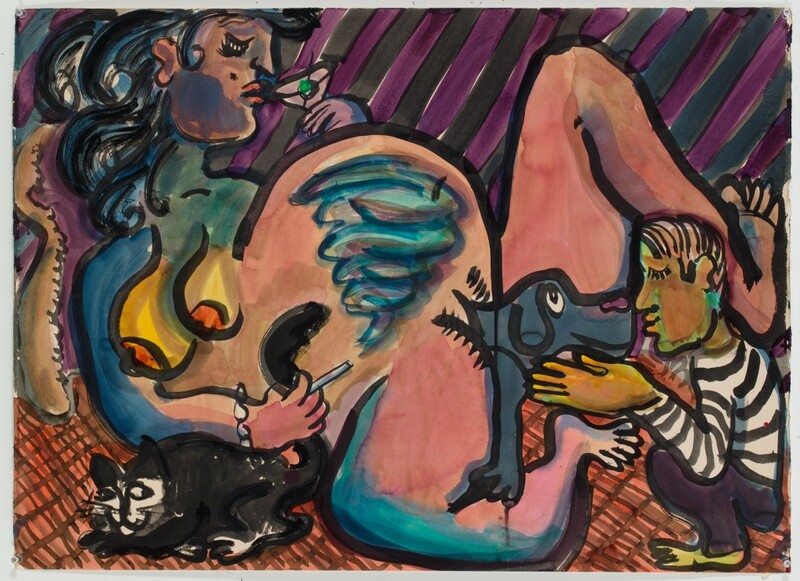 The Physical Checkup, 2015, ink, watercolor, pastel on paper, 20 x 25 in. The Plague, 2015, ink on paper, 53 x 60 in. 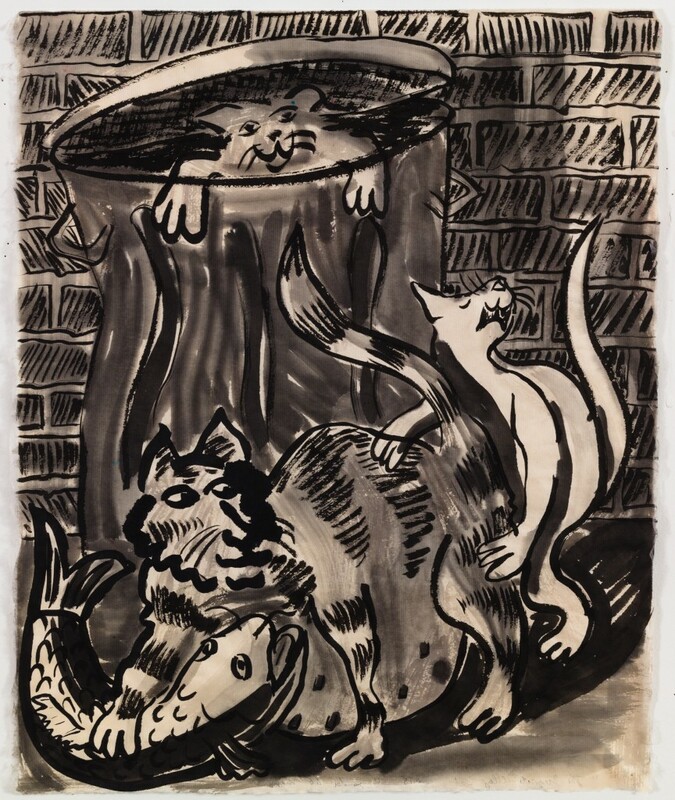 The Pregnant Alley Cat, 2015, ink on paper, 20 x 17 in. 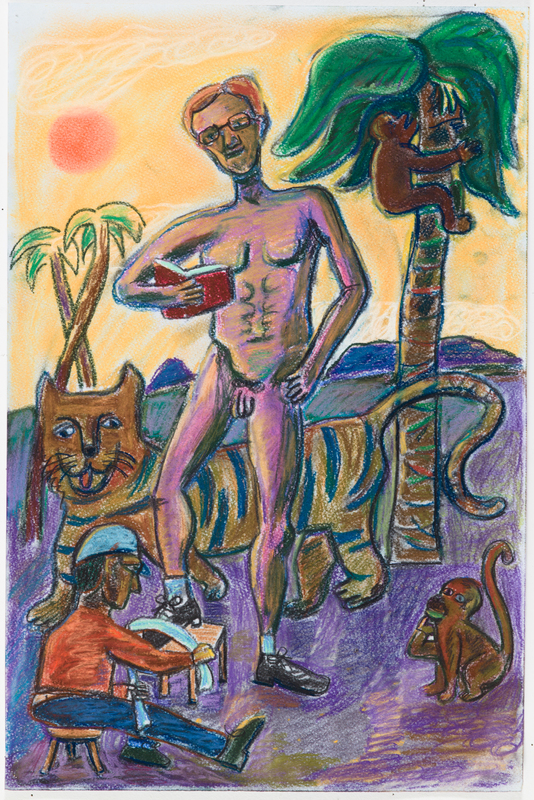 Tropical Shoe Polisher, 2015, watercolor, pastel on paper, 18.5 x 12 in. 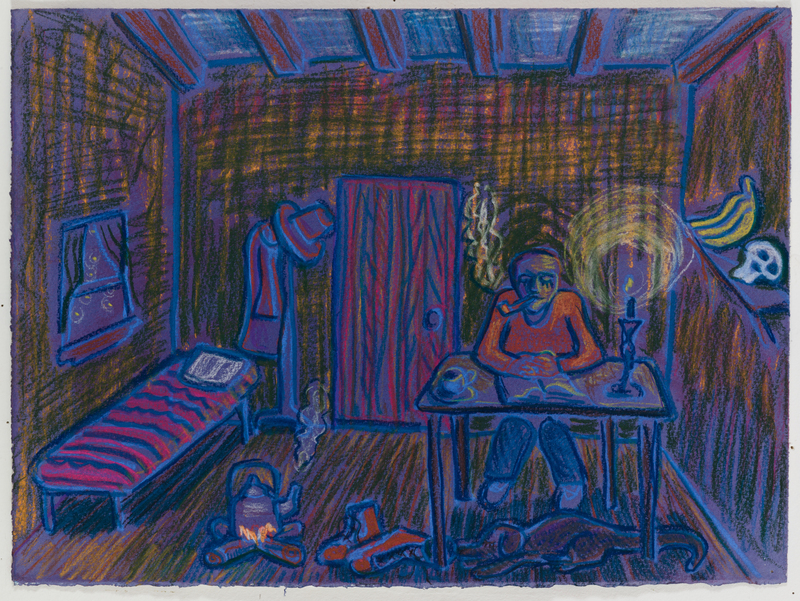 Untitled (Meditation in Candlelight), ink on paper, 22 x 30 in. Untitled (Men Eating Soup), 2015, Ink on paper, 13 x 15 in. 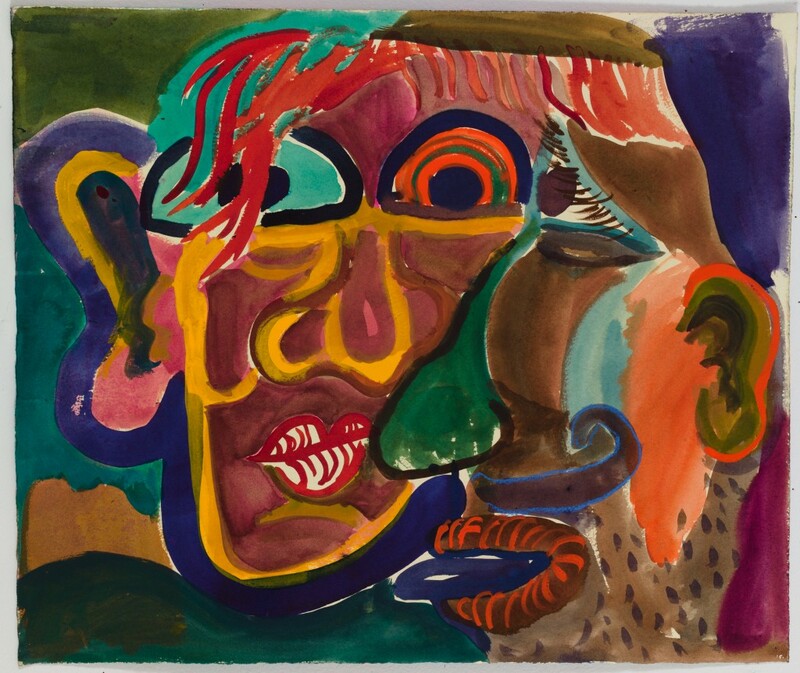 Untitled (Two Heads), watercolor, gouache on paper, 17 x 20 in. 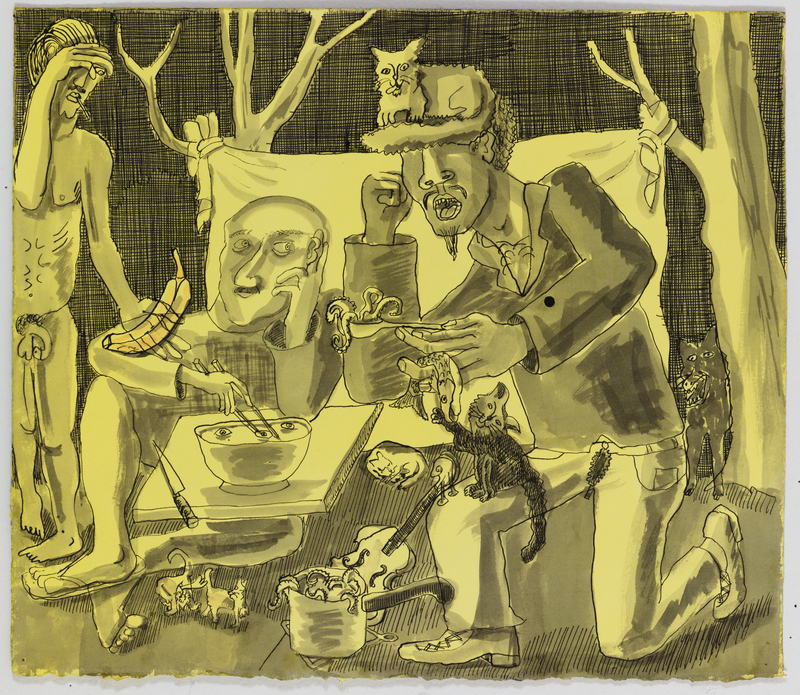 Untitled (Two Men w/ Doll), 2015, ink, pastel on paper, 19 x 25 in. 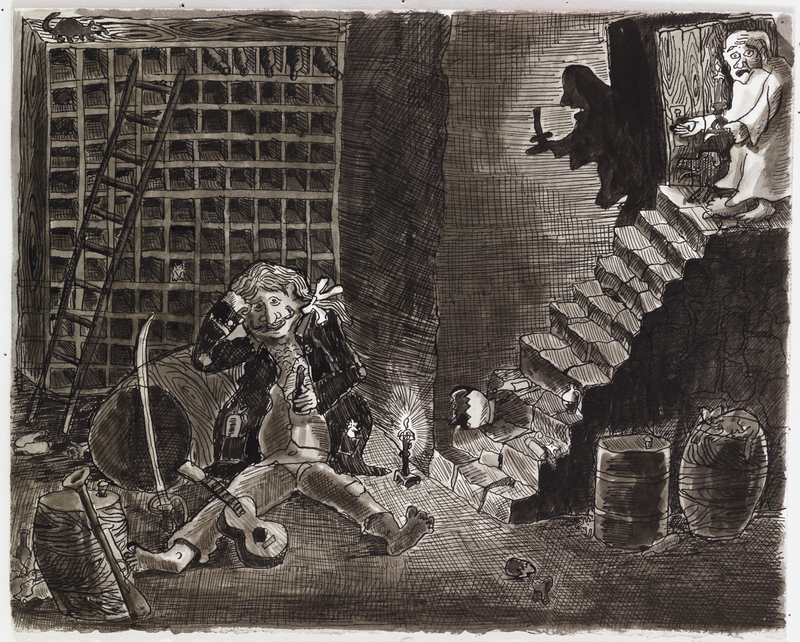 Wine Cellar w/ Drunk, 2015, ink on paper, 12 x 15 in. 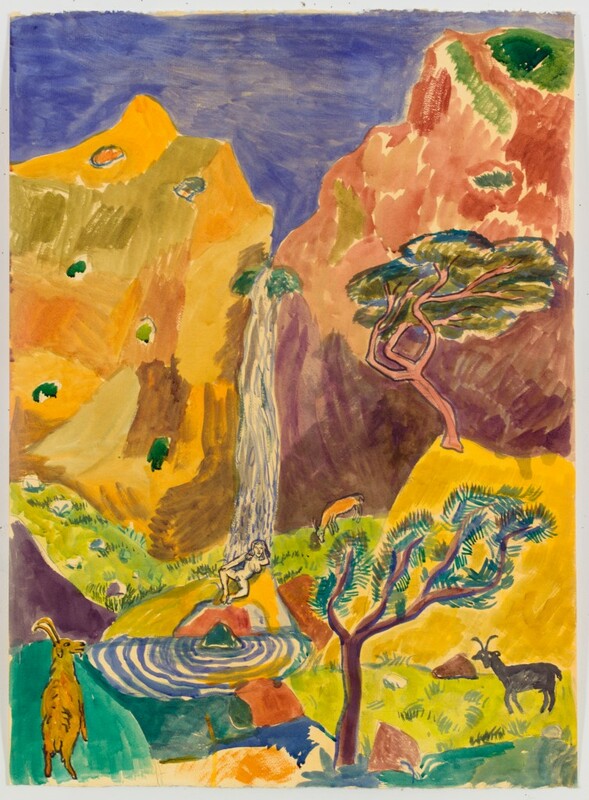 Woman Bathing at Waterfall, 2015, ink on paper, 30 x 22 in. 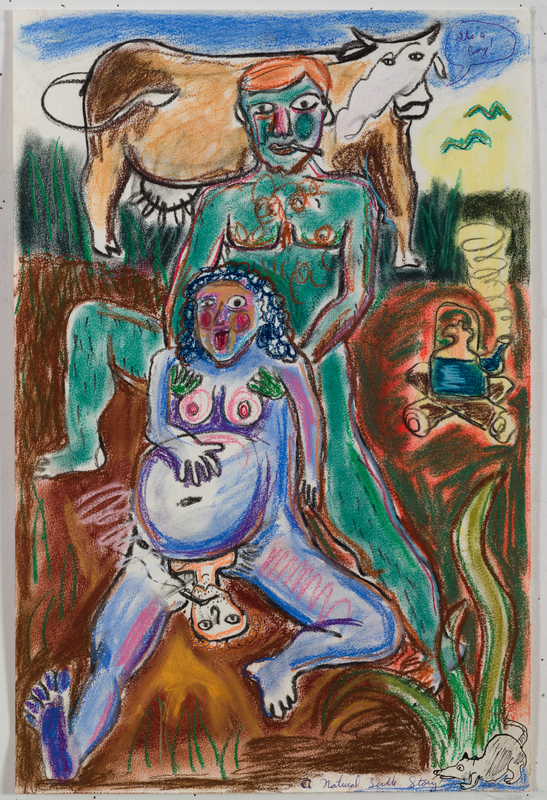 Woman Giving Birth to Dog, 2015, ink on paper, 22 x 30 in. 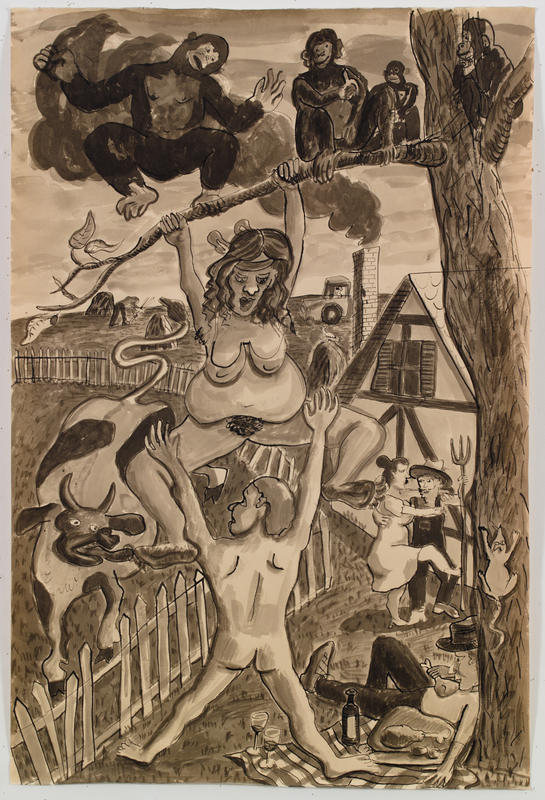 Woman Hanging from Tree, 2015, ink on paper, 38 x 25.5 in. 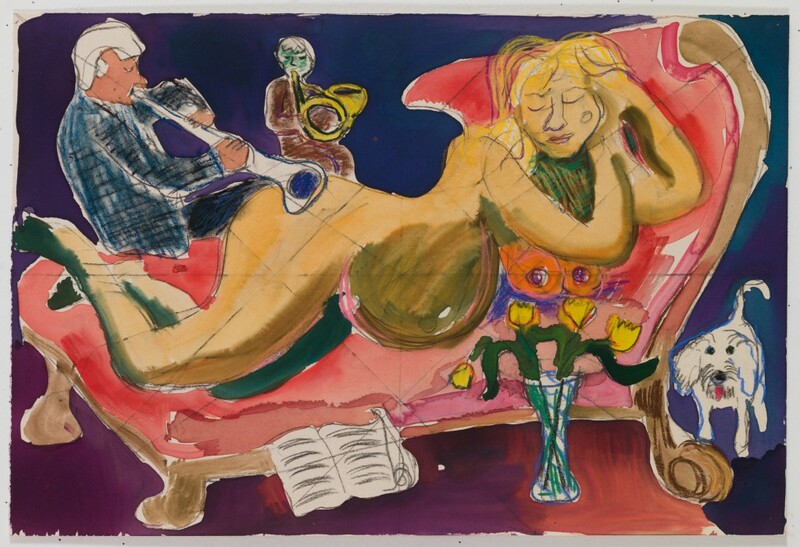 Woman Reclining (w/ Musicians), 2015, ink, pastel on paper, 14 x 20 in.